Well, we are almost to a spot to move on to other things in this renovation. Oh, it’ll still be the same room, but we’ll get off the ladder for a while and trim out windows and build a built in bookcase/ TV doodad. First up is getting some primer on the walls. 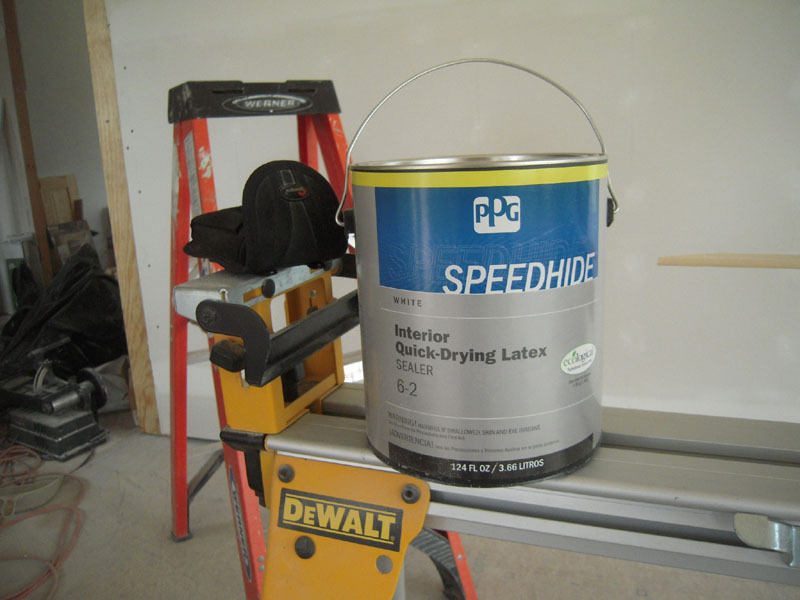 Since this is new drywall I like to use a sealer primer. I like most of PPG’s Speedhide products for this. I kind of got stuck on the ceiling design. 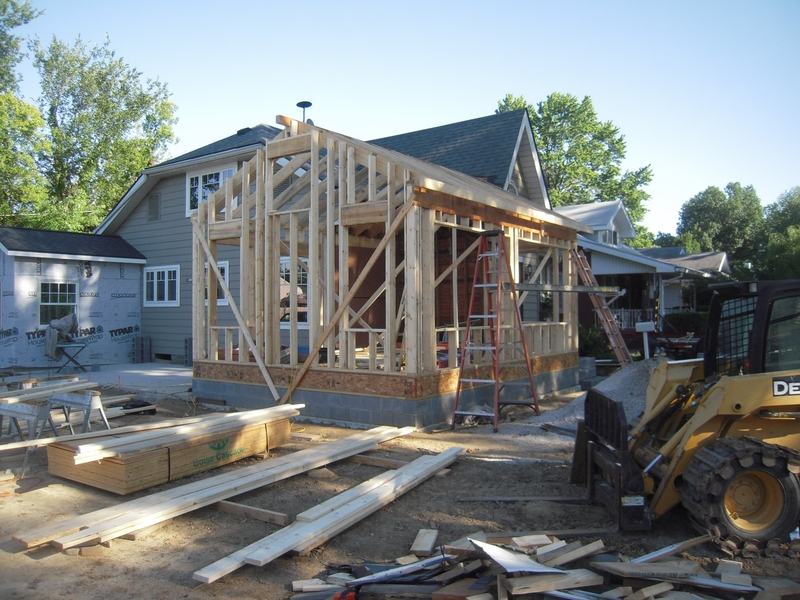 As most of you know there’s not much planning around here at Adventures in Remodeling. 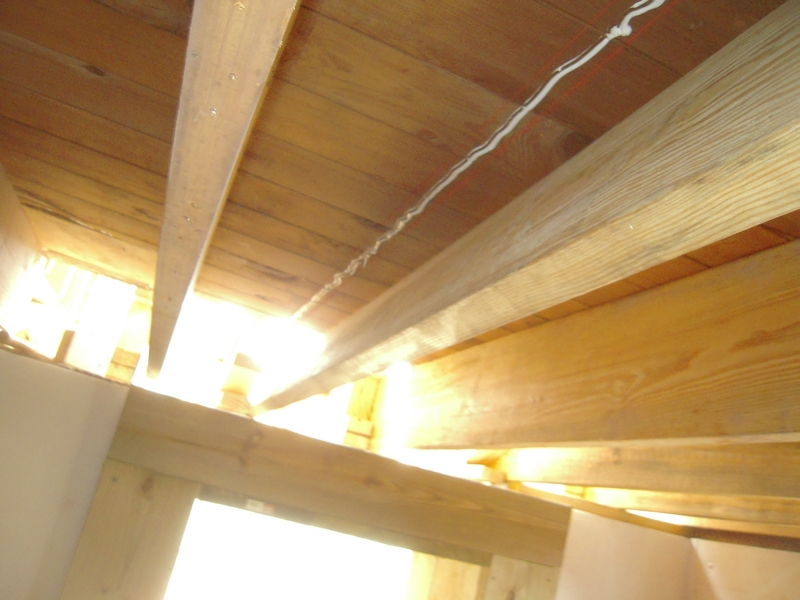 I made the side beams and they meet at the top between a flat 2X4 ridge. So I whipped up these little soldiers to do the gap battle for me. They’re really just four 2X4 glued and nailed together to give me the width I need. 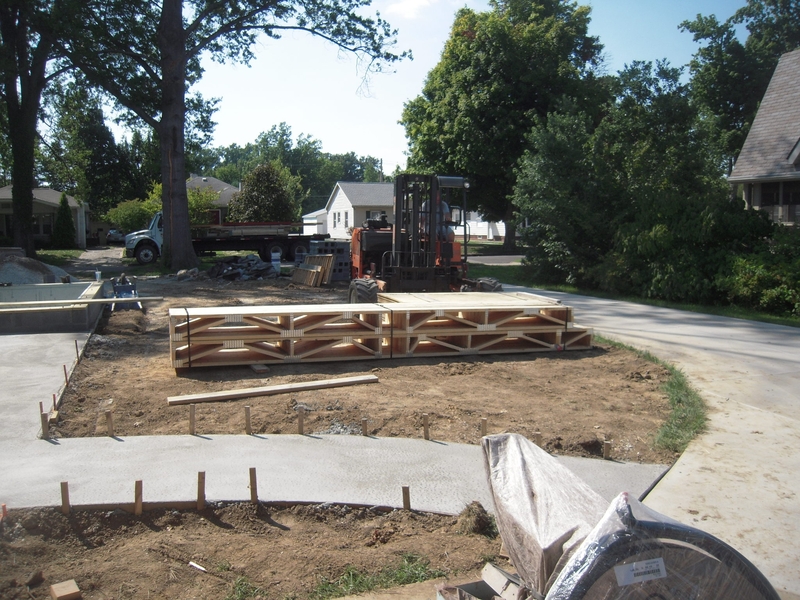 Here’s the start of filling the gaps.The blocks cover the center 2X4 and tie the two side beams together. Next we make the center panels. Just some #2 white washed pine with a bevel edge. The holes are cut for the chandelier electrical boxes. Now the center panels are in place and we have a gap to fill between the side beams and the center panel edge. So I made up some little spacers and glued and nailed them in place. Then I decided I wasn’t fond of those pointy little spacers – after the glue had dried. Then it’s time to caulk – and I’m really good at this. I use a good 100% acrylic latex painters caulk. I have projects that still look good years after caulking with that stuff. Then all we have to do is cut up some trim boards and paint them all up pretty. I cut the trim boards to fit between the side beams. 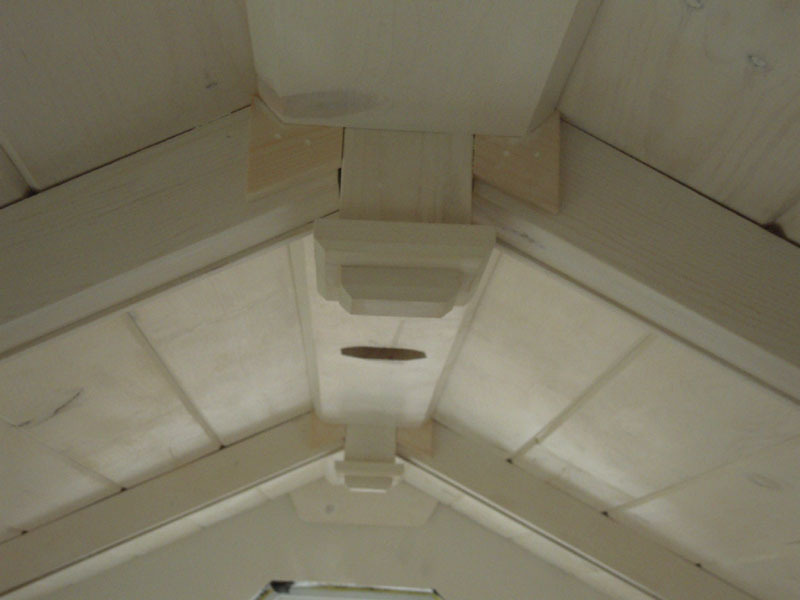 I made them narrower in width so the side beams sat proud of the trim. Then we add the wall trim and we can put away the ladder for a while. Oh, except for trimming out the octagonal window. 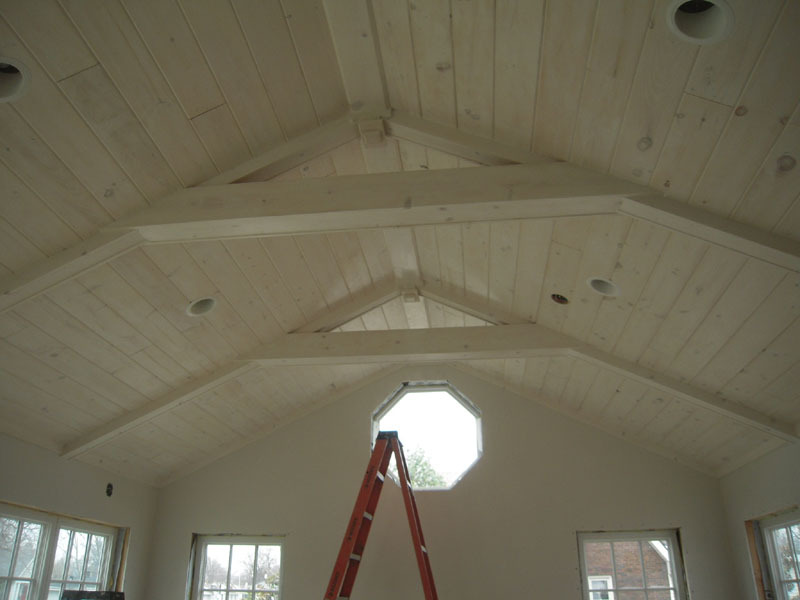 Then there’s the lights on the beams – oh, and the surround sound speakers. But let’s not push my luck. 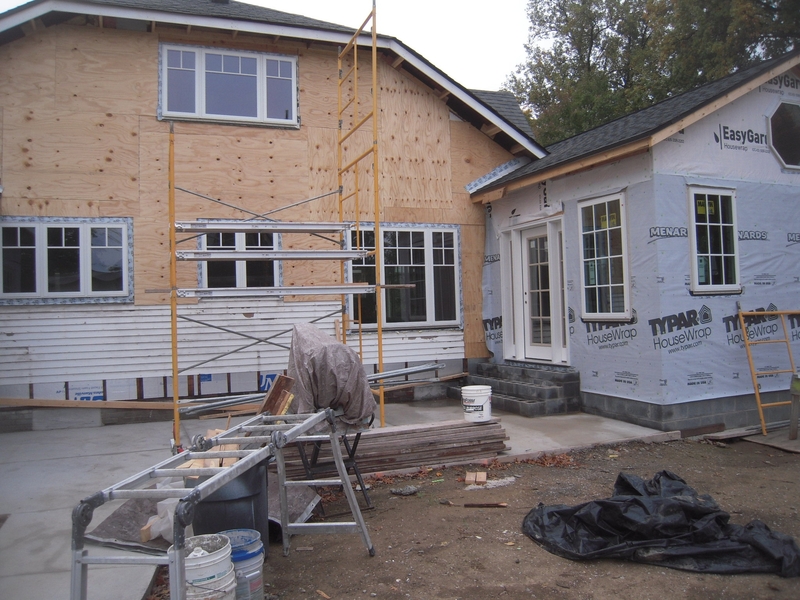 I wanted to back up a little and address the exterior project that paralleled the window and door installation. Totally pointless to most readers, unless you are doing the same. 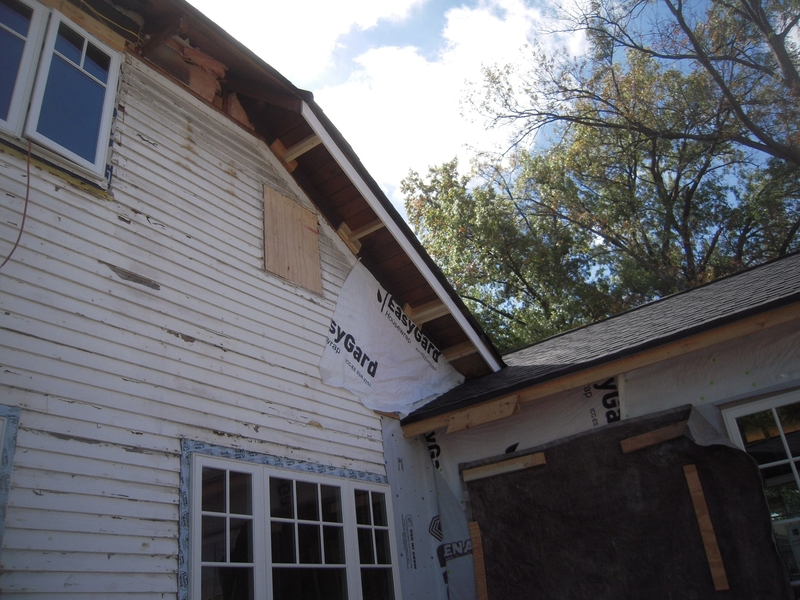 I instructed the framing crew to place 1/2″ CDX plywood at the intersection of the old house wall and the new roof. You can see the 2 pieces of ply with the roof flashing here. The problem was they used 5/8″ ply instead. Now 1/8″ difference might be ok for most… But not me. So five hours later I have the correct thickness plywood in place with the proper roof flashing. I feel so much better! 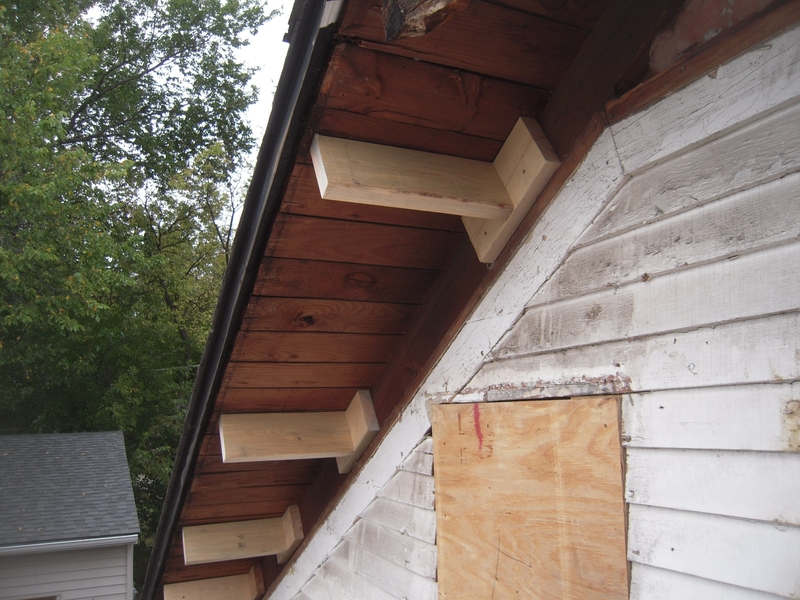 Don’t worry, those skanky eaves will be replaced. 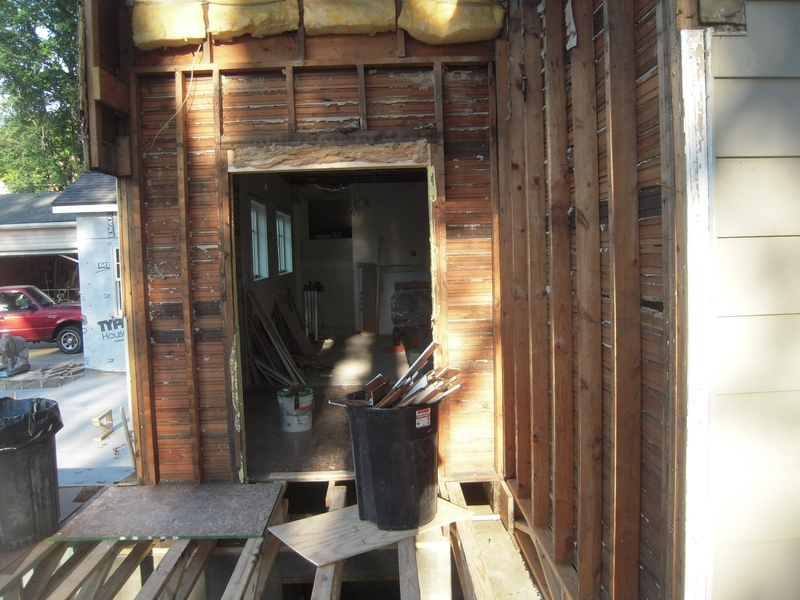 The reason for all of this fiddling is that the exterior wall in this 1930 bungalow has no exterior sheathing – just the wood clapboards. 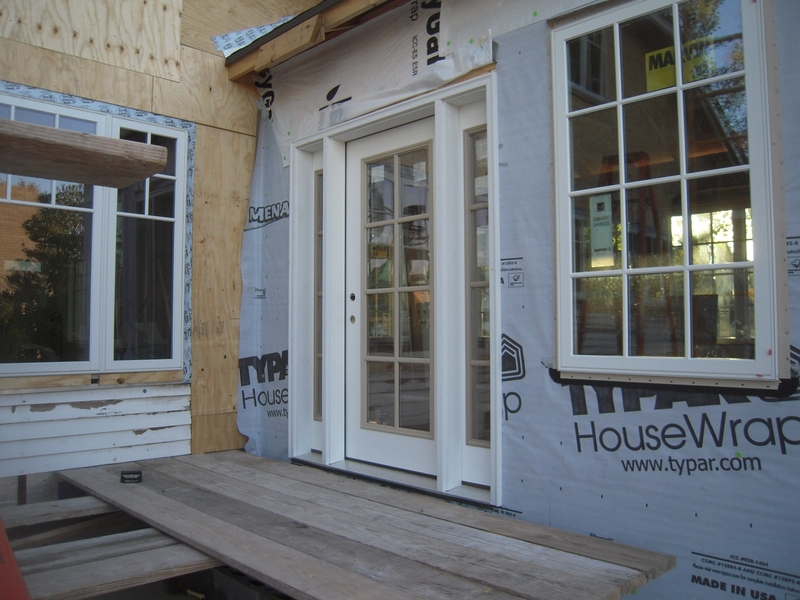 The interior of the exterior walls have 3/4″ tongue and groove sheathing – so it’s built like a tank. Only on the inside. The idea with the plywood is to remove the existing aluminum siding (the green stuff) and replace with Hardie cement siding and limestone trim. Here’s the beautiful view my neighbors have of our project. No wonder they’re gone a lot. The original house had an unfinished upstairs – so large vents were placed on either side of the window. These were partially blocked when previous owners converted the upstairs to living space. Now I’ll do away with them all together. 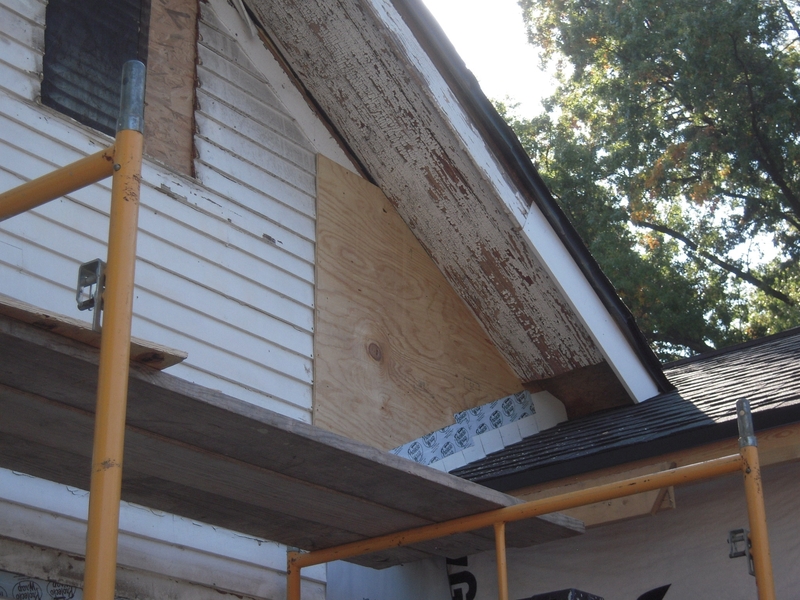 Of course no remodeling is complete unless you rip off the fascia boards and rafter tails. This part is a PITA especially when you’re 20′ in the air. There’s a lot more going on here than you might realize. 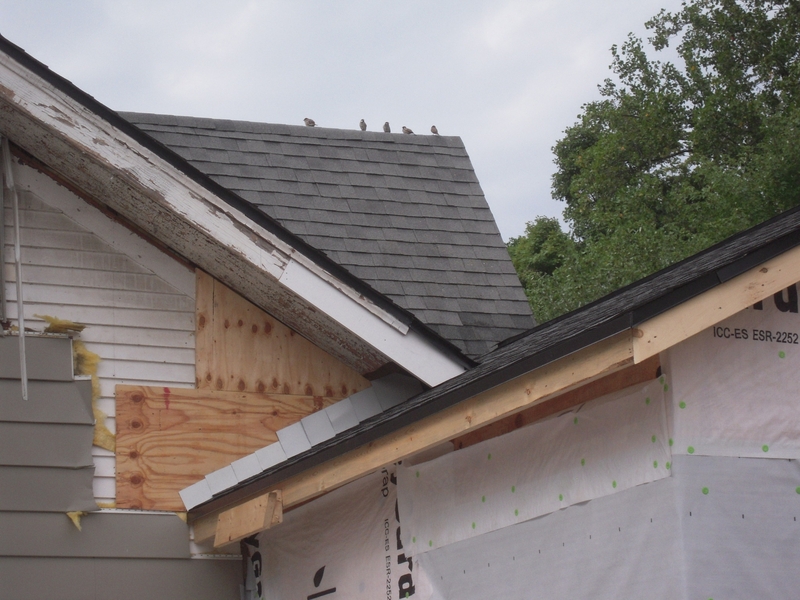 Since we’re changing the way the roof is vented we have to add soffit and ridge vents to properly vent the roof sheathing. It’s important this is done correctly. You can see the new vent chutes that are in place to bring air in under the roof deck to be expelled out the ridge. 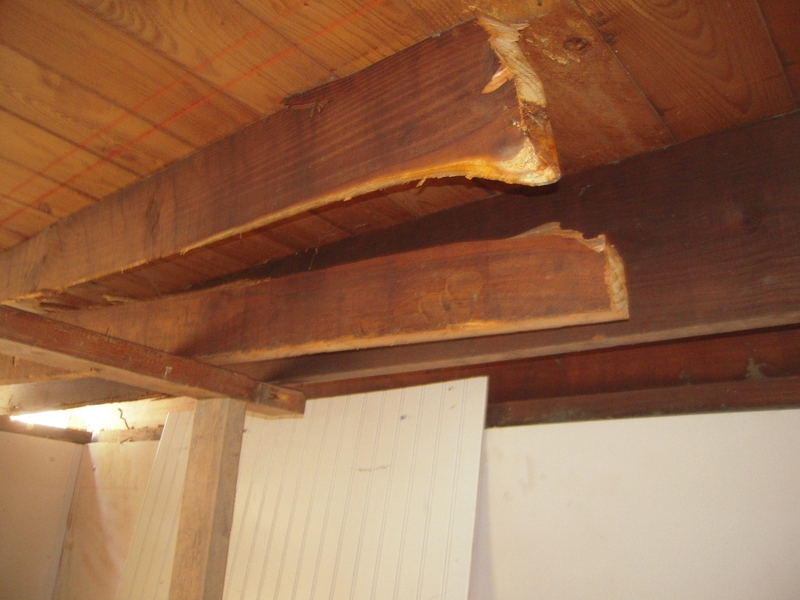 The rafter tails were just toe nailed into the roof rafter and were sagging badly after 70 plus years. Plus rot and insect issues. No fun. Plus no window header was installed, so that roof had to be jacked up to get a proper header in over the window. I fabricated a new set of eave outriggers that would be attached to the roof rafter making a much stronger eave assembly. The new outriggers will allow for adding the fascia boards and keep them straight. These are much stronger and will add support to the roof. This is the start of the fascia support. 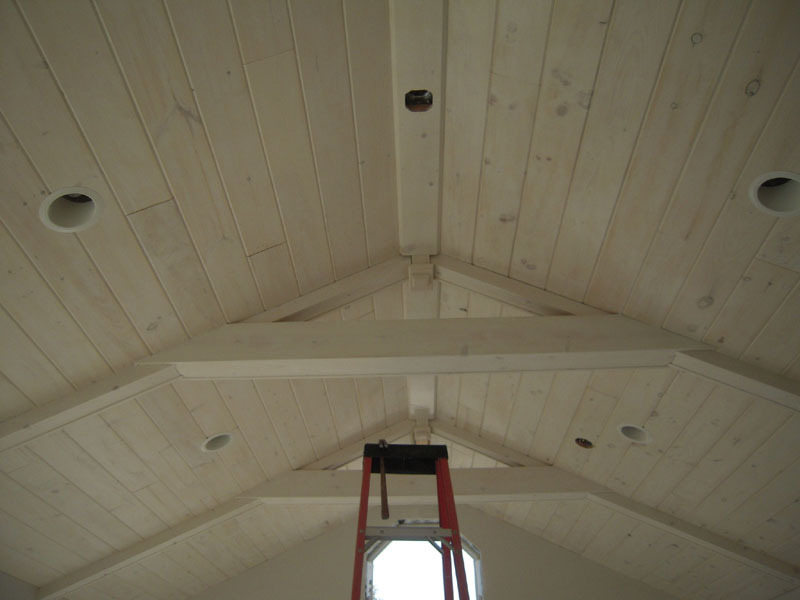 This is 1X8 pine that has been primed. If you look closely you will see the first 3 feet next to the roof is an AZEK trim board.This waterproof material will keep the rain from rotting it out. 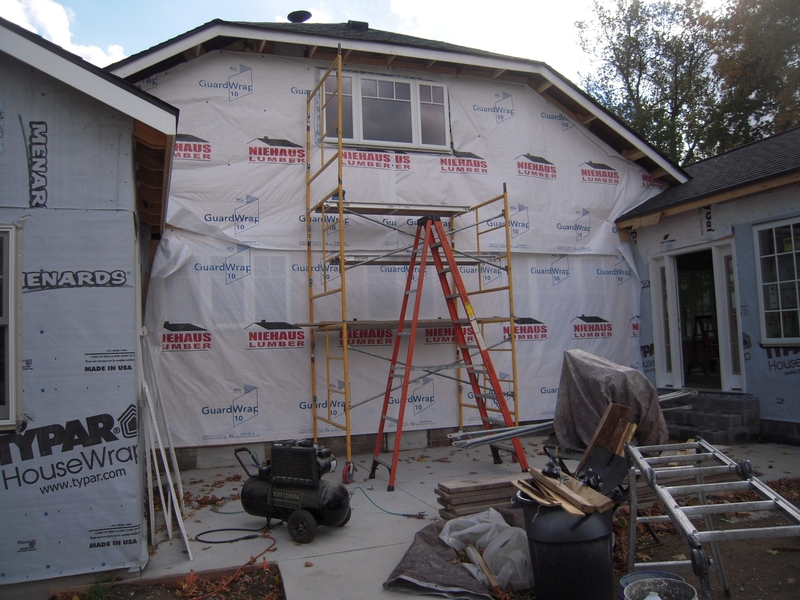 After all of the fascia is up, it will be overlaid with another 1X10 AZEK trim board to make it weather resistant. 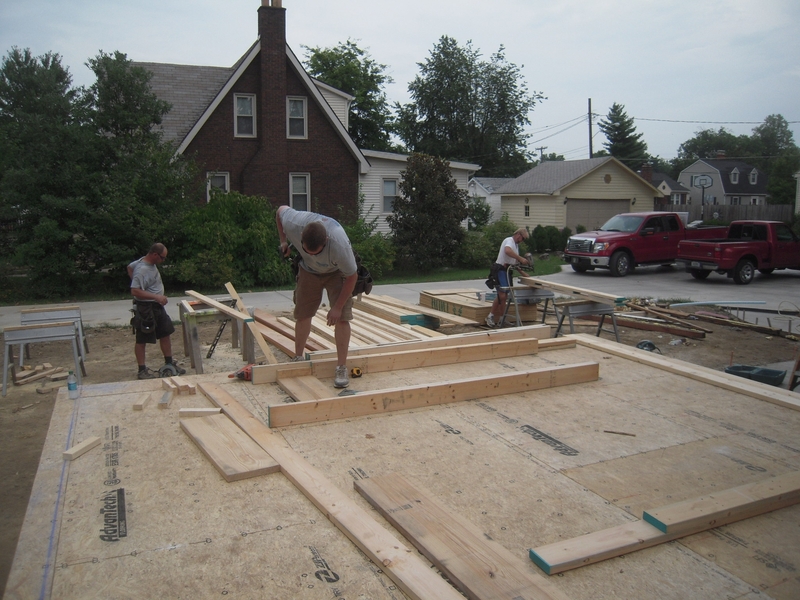 The whole exterior of the existing building will be covered with 1/2″ CDX plywood. This will give a strong and flat base for the new siding. 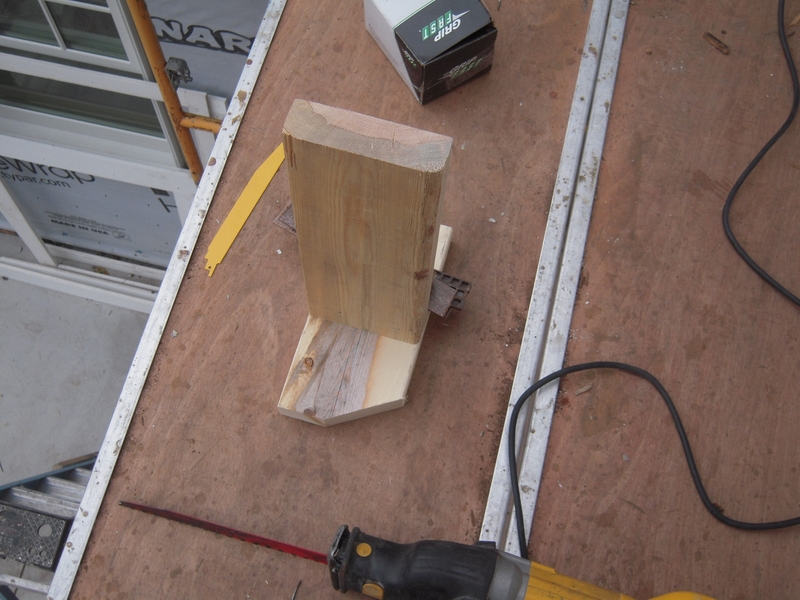 I made a jig on the scaffolding so I could put up 4X8 sheets of plywood solo. The plywood also acts like a type of rain screen. 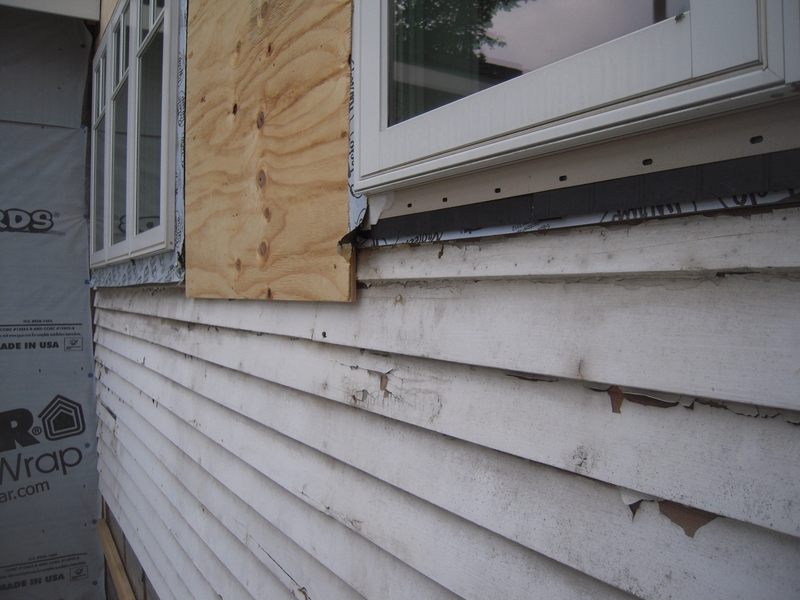 The spaces between the clapboards and the back of the plywood will allow for it to dry if moisture gets in. 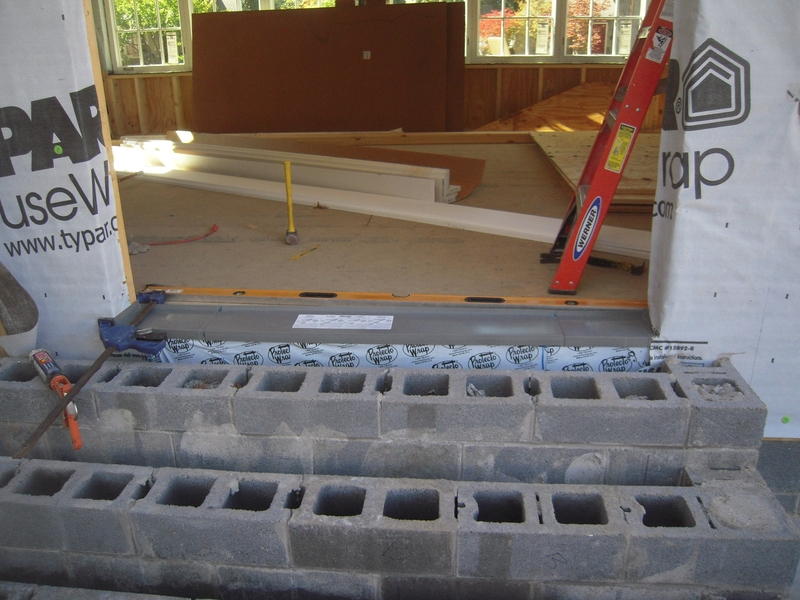 Trapped moisture is a major problem in modern home construction. Old houses rarely had rot issues because they were so drafty and many uninsulated – water could get in and out quickly. Not so in today’s homes. 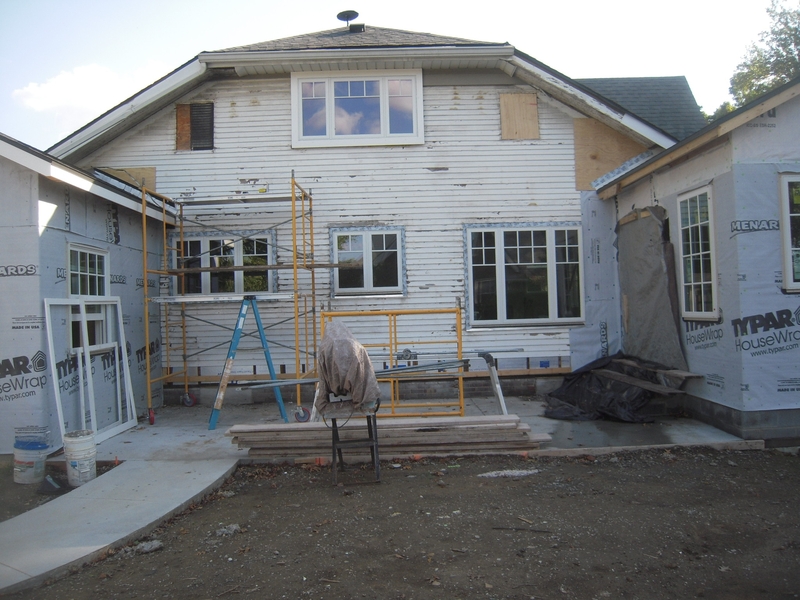 After the plywood is on the housewrap goes up, just like new construction. The only bad deal here is that the windows were already installed. If I had known at the beginning I would do all this…sigh. The detailing is critical on the housewrap. Always think like water. Bottom pieces go on and then the top overlaps. I was able to get the window details ok, but not perfect. Drip caps over the windows are a must. That is unless you are one similar to me, who just has to be DIY. I want to apologize for the long delay in posting. I do have a job outside this renovation, and sometimes my wife makes me work at the business. Darn the bad luck. Also, most of what’s been going on at the “Hobby House” has been, well – pretty boring stuff. 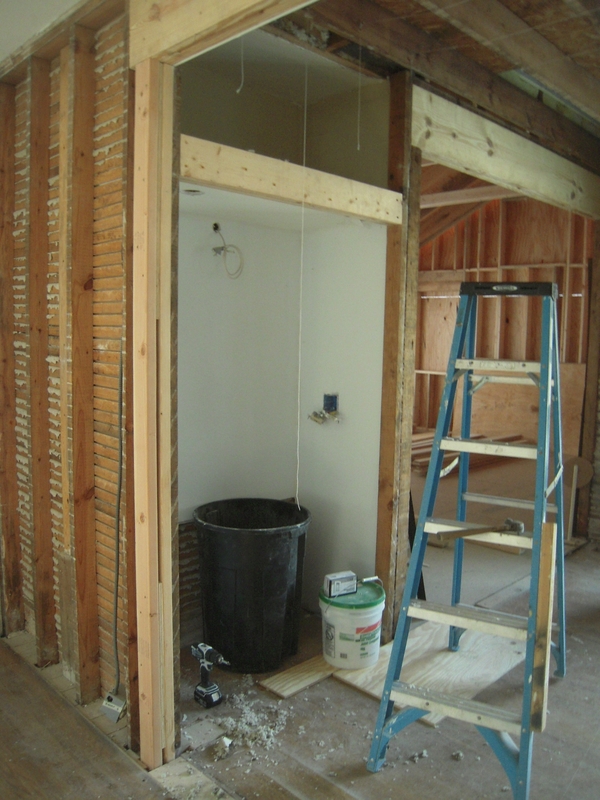 Unless you think all new plumbing (again) – redoing the upstairs closet (third time) and all new HVAC systems (two) are stimulating. But I’ll post about them as well in the future. At this rate you’ll be reading about it in a couple of years. So back to window installation details. After installing 15 or so of these windows I figured out a jig system that would make the installation more accurate. 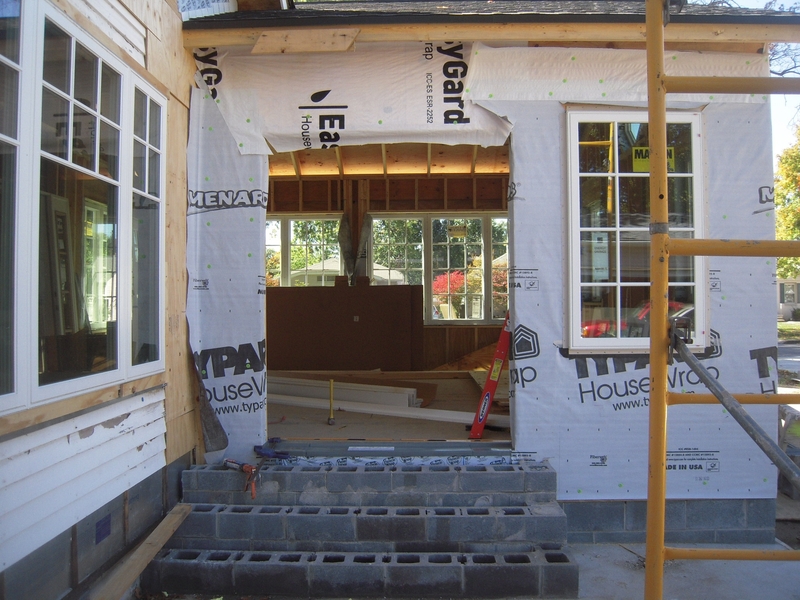 New construction windows usually have a nail fin on the exterior that allows the window to ‘flex’ a little in the window opening. 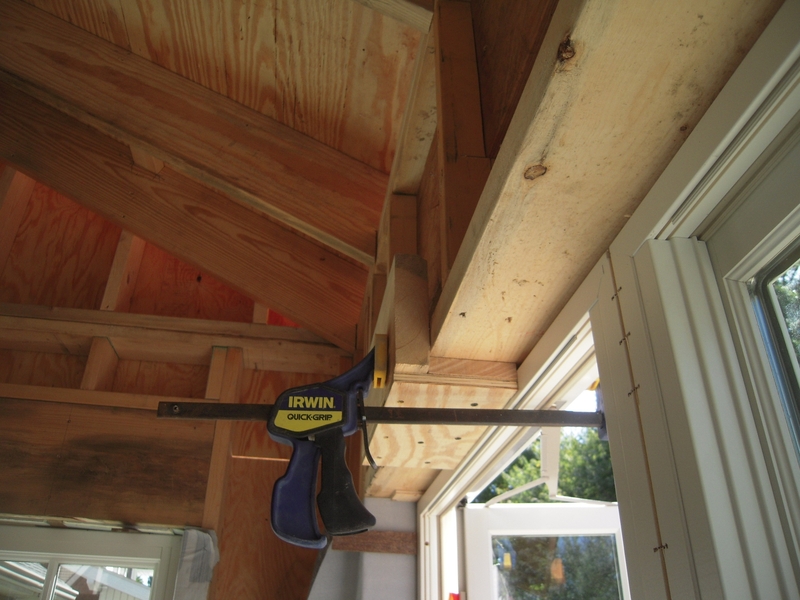 This jig will keep you from constantly checking the plumb of the window frame with a level. 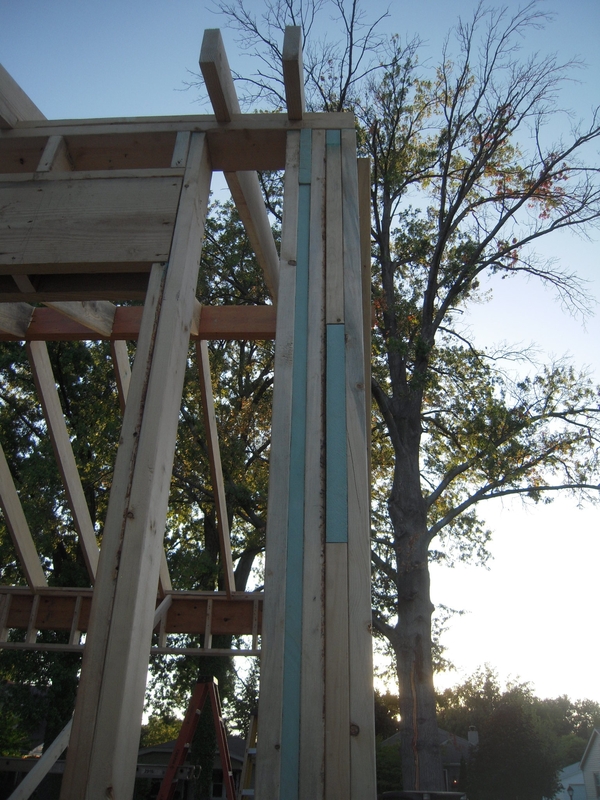 If your window framing is plumb, your window will be too. This makes the jamb extensions much easier to fabricate. Once you have the window in place you can shim and screw in place. Talking to the Marvin window rep in our city, he said many new installs are just attached by the nailing fins. This will make the window fail in short order. Follow the window installation instructions and you’ll be just fine and dandy. Whenever possible use a small solid shim like the one pictured. The screw goes through the window frame and into the wall. 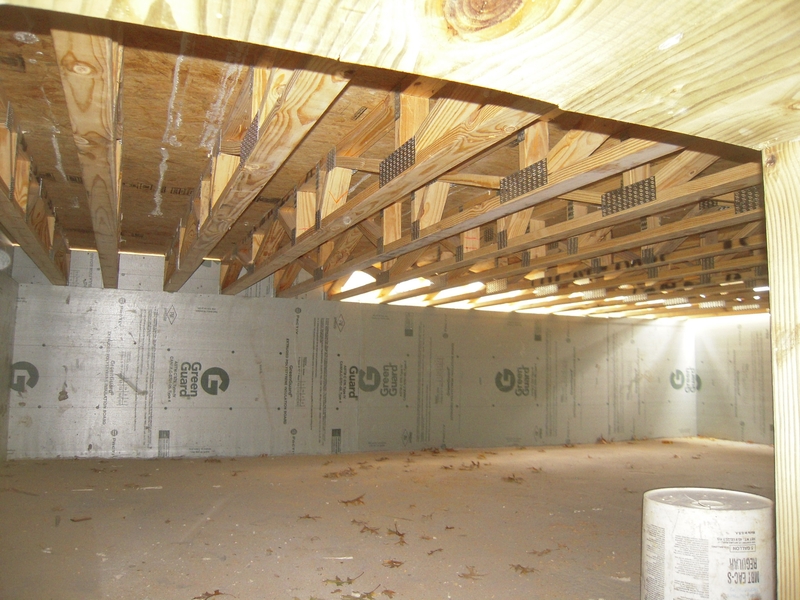 This small size allows for more foam insulation and keeps thermal bridging to a minimum. I told you this would be a boring post – so you were warned. Here is the foam after the shims are in place. The picture looks like only one shim is located at each screw location, but in fact there are two facing opposite directions. This is to keep the surface that the window is attached to flat. One shim only will give you a slanted surface – flat is better if possible. Another problem with this photo – no protective tape. These windows were ordered pre-painted. The others I put in were just primed. I should have run a strip of painters tape along the outer window edge before I foamed them. Here you see the metal straps attached to the bottoms of the windows. The straps are then attached to the wall sill at the innermost edge. This keeps any holes in the sill guard window pan inside and away from any possible water intrusion. 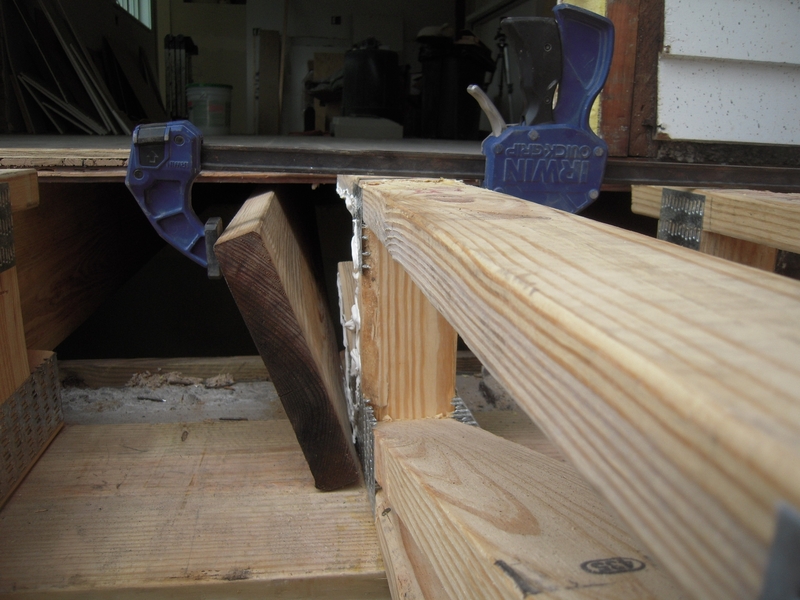 This was a 2X6 wall – if this was 2X4 you could bend the straps down and attach inside. The start of trimming the foam. You can see some residue on the frame of the window. 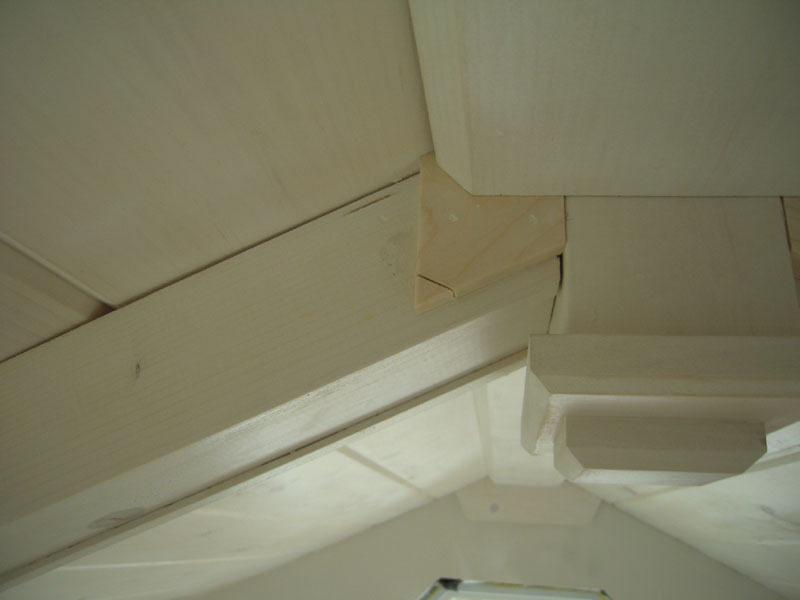 The jamb extensions I’ll fabricate will cover most of this – but the tape would have kept this clean. The best thing for trimming foam I’ve found is a blunt trim blade for an oscillating saw. Will cut the foam, but easy on the woodwork. Here is the rough opening for the patio door. I won’t go into more boring detail here – but let’s just say the door was framed with the top opening the correct dimension and the bottom 1 1/2″ too narrow. Gotta love that framing crew. So with a saws-all and a little time I straightened everything up to the right size. Whenever possible, use a sill pan or other protection to keep water away from any wall penetration. Here you see a PVC sill pan over protecto-wrap. The concrete blocks will be capped with limestone treads. This door was a Plaspro fiberglass door unit. Here you see my camera shy brother helping me get the door in place. Well, I’m taking pictures instead of helping. Sorry ‘bro. Couple things to note here. I went with a single 36″ wide door with sidelights instead of a french patio door. When I’ve had double doors before I rarely needed the second door. This combination made more sense to me in cost (a little more than 15% less) and is more energy efficient. 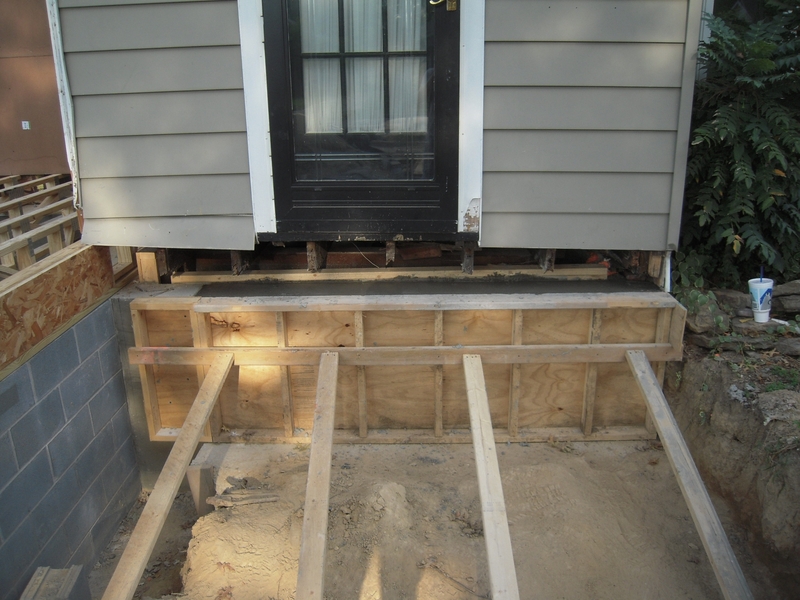 Also note the scaffolding I built from the top step – this little door weighed in at over 400 pounds. Even with the door out the frame and side lights was over 200 pounds. The scaffold was a good idea and only took a few minutes to fabricate. So there you have the latest installment of this ongoing adventure. Exciting? Not really – but stay tuned – something exciting might turn up sooner or later. Well, I look at the calendar and it’s been over a month since I touched the keyboard for this next post. 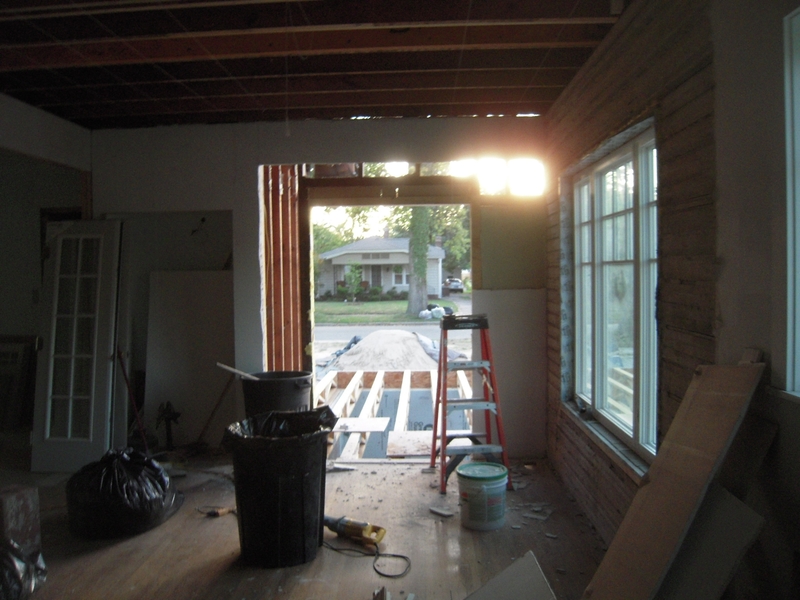 Things have been pretty busy here at Misadventures in Remodeling – as in lots more misadventures. Dang, I think I’ll have 5 years of posting to do by the time I get this thing finished. But let’s continue with that Sun room addition. 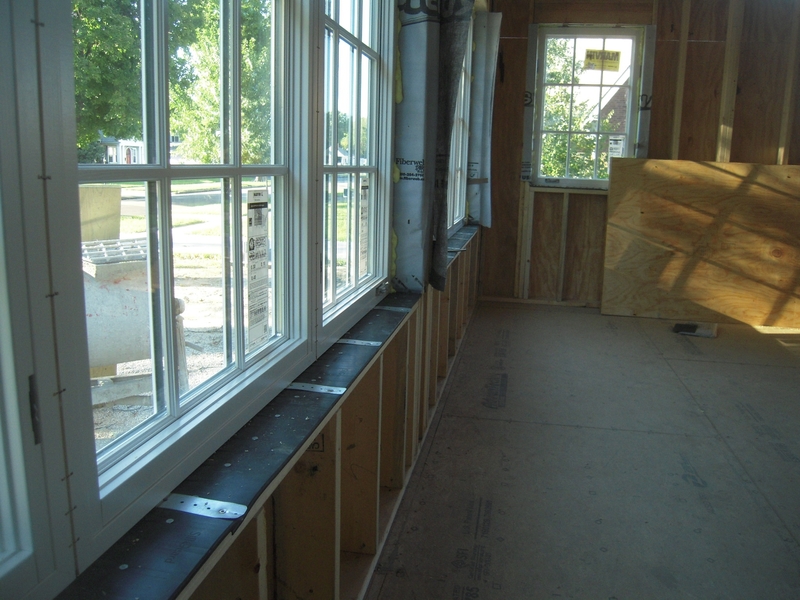 Here is a typical window framing detail. Header above, jack and king studs on the sides – sill at bottom. The walls are 2X6. 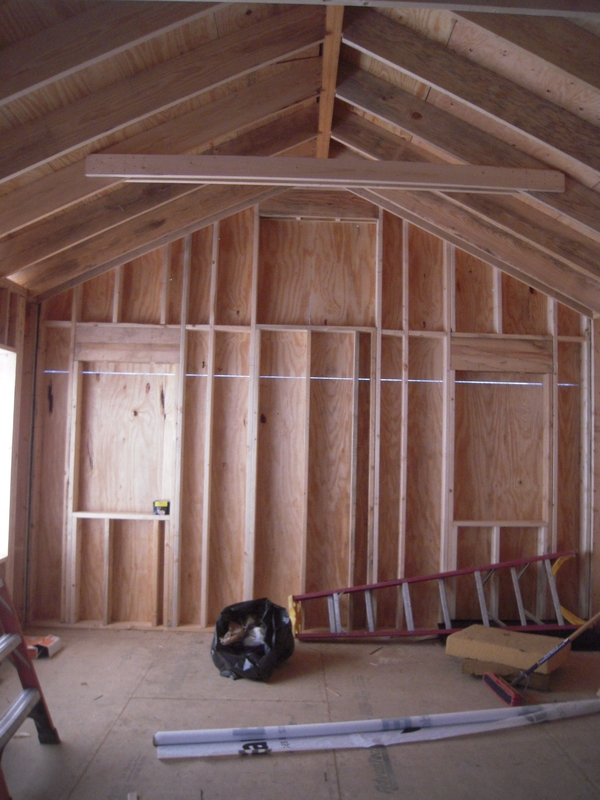 I used 1/2″ plywood for sheathing, but most use OSB. 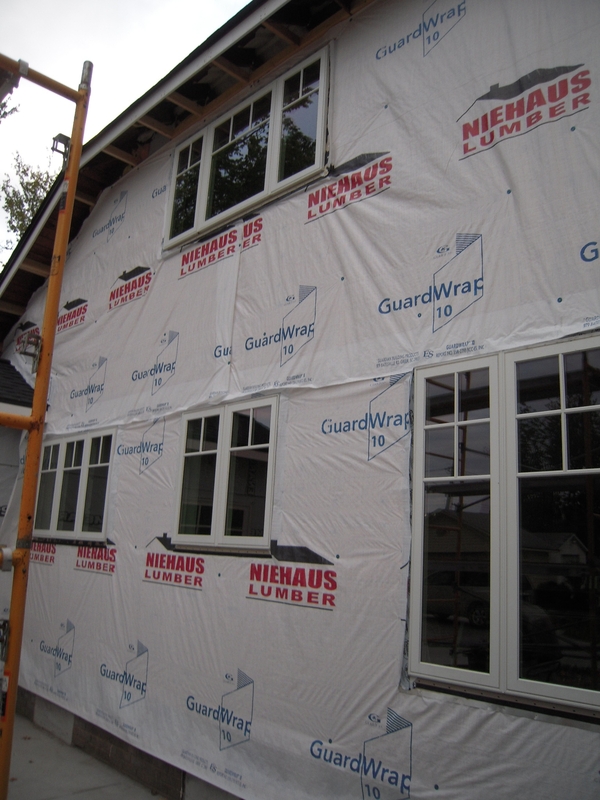 Sill guard is used to waterproof the sills. Marvin windows made this, but I think it has been discontinued because it was hard to work with – now you tell me. 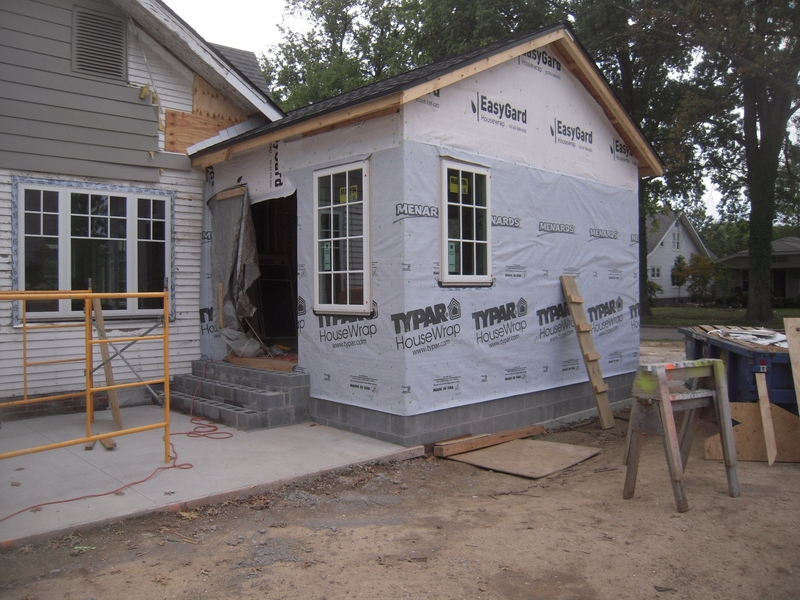 House wrap in under the sill. The wrap will be pulled around to the inside on the sides once the sill guards are in place. 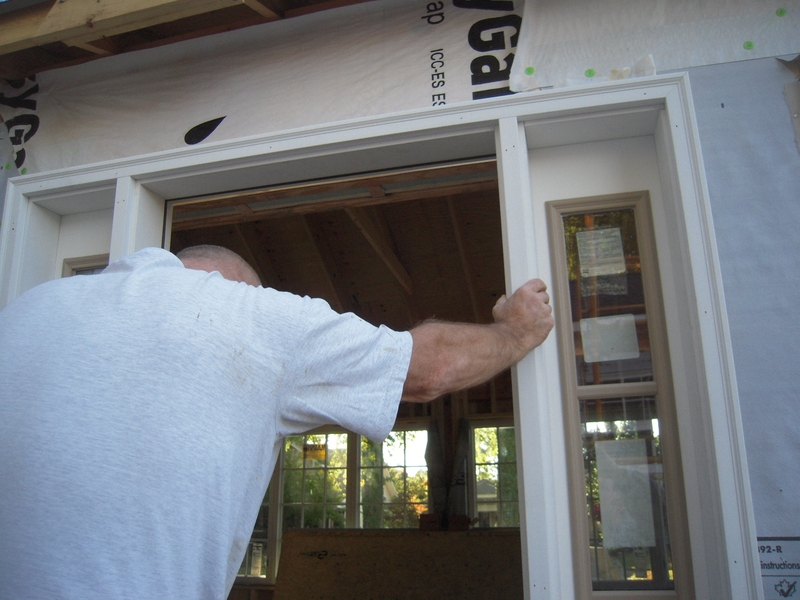 The smaller windows are pretty easy to instal by yourself. 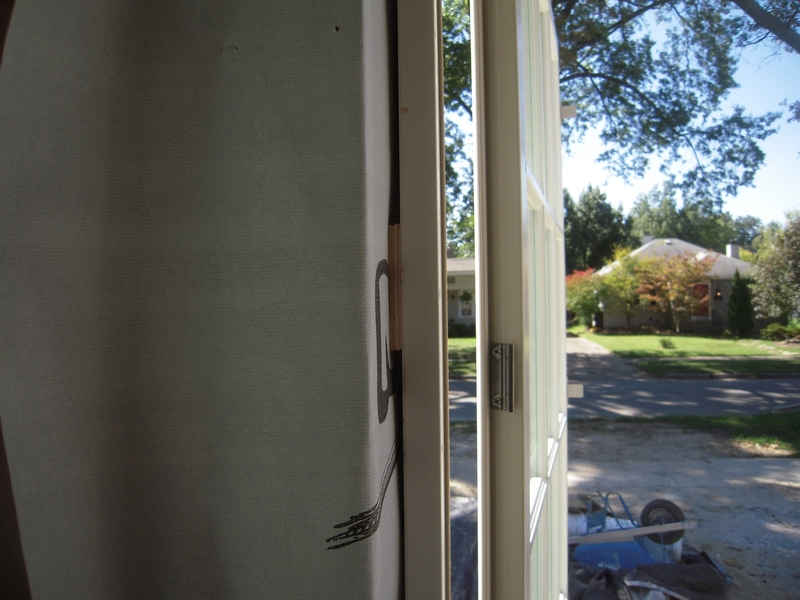 Here the house wrap is pulled inside on the window sides. 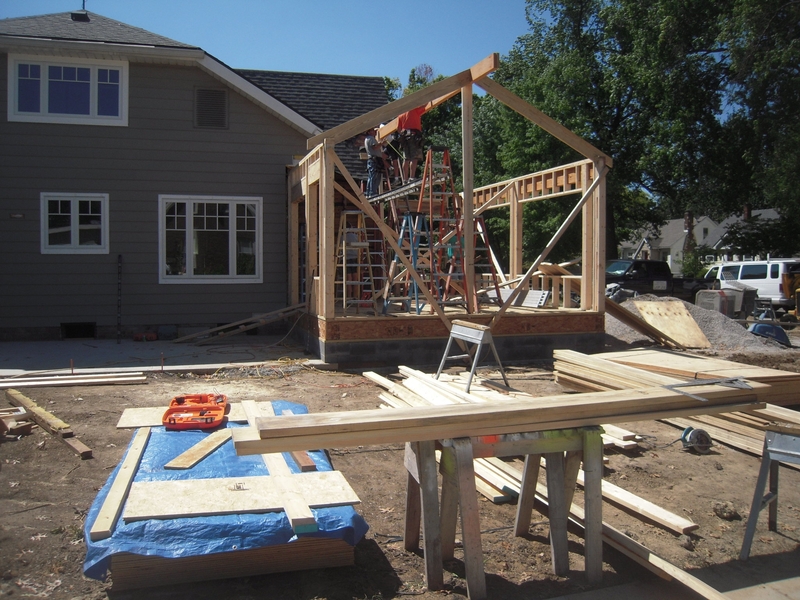 Just take the windows out – you now have a frame that weighs 30 pounds or so – sure beats trying to hold up a 100 pound plus window from outside on a ladder. Now we’re in the big leagues…gulp – these weigh in at 250 pounds and are over 7′ long. Drop one of these on your toe and it’ll leave a mark, I tell you. So we do the same – the center window is fixed and each side window opens. Taking out the windows lightens the frame up to around 65 pounds. 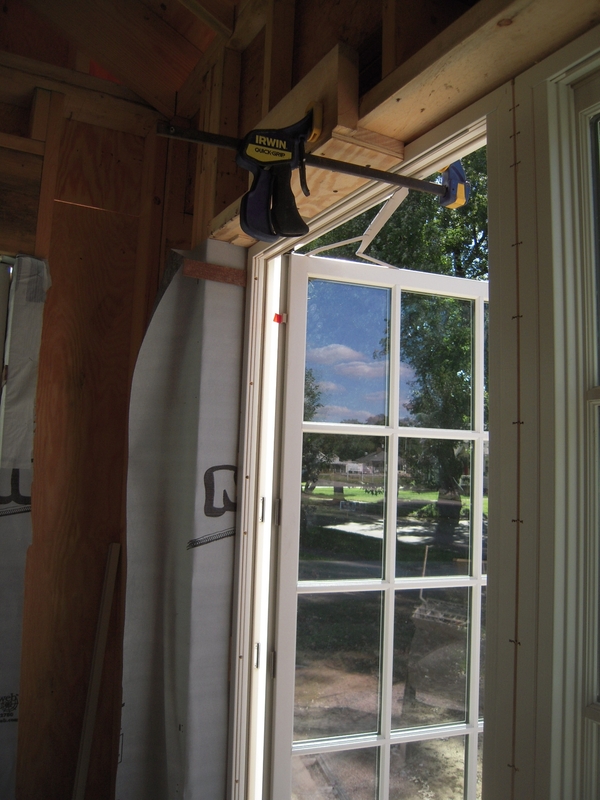 Proper installation with sill guards call for mounting straps on the bottom of the window. This way you can solidly attach the bottom of the window into the structure without putting holes in those fancy sill guards. Here’s were neighbor John comes to the rescue. He holds the frame while I square and plumb the window. Here John holds the center window in place while I reinstall. 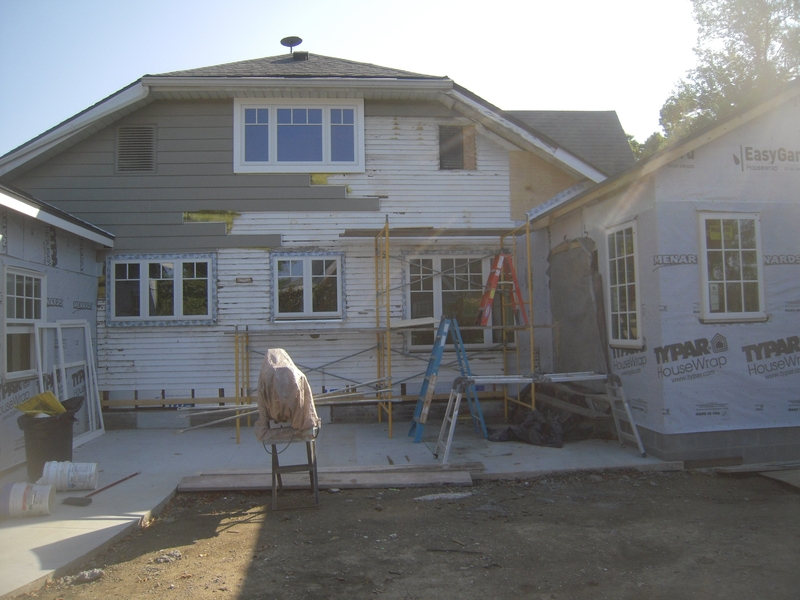 The opening casements on each side just snap into place. But they are heavy! The two big boys in place. Now to go lay down and take a rest. These dogs were almost too much for this old renovator. Things are starting to take shape. 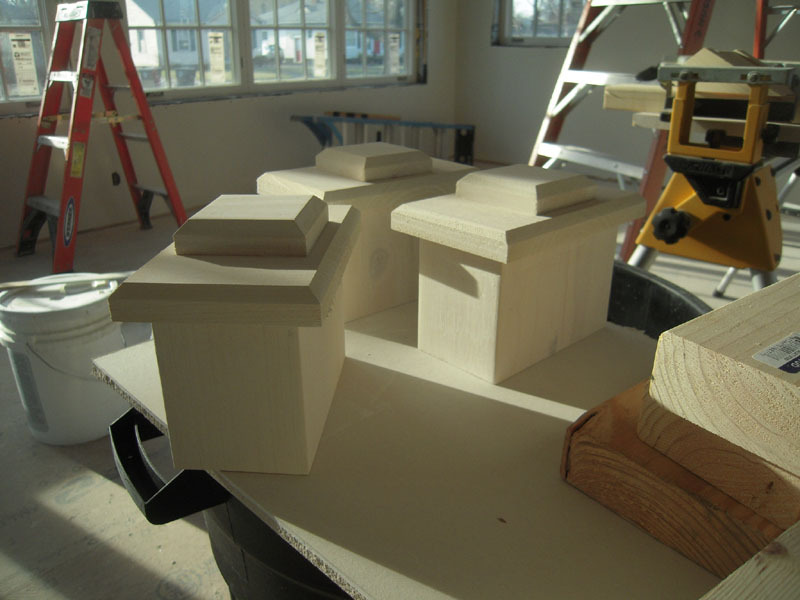 The octagonal window will have a stained glass insert. This wall will have the TV and fireplace below. With custom display cabinets – whenever I get around to designing them. That’s it for now. It’s the time of the season that I sweep away the sawdust and spend some quality time with the loved ones. I hope you have the opportunity to do the same. May your renovations be merry and bright – and all your fixtures fit right. The weather is starting to change, so I’m in a race to get things buttoned up before we get below freezing. Not to mention that I ripped out both floors’ HVAC systems. Yikes! Gotta kick things into overdrive. A word about wall construction. There are several ways to build the wall corners. I usually build them with a ‘U’ shaped element that faces towards the interior. 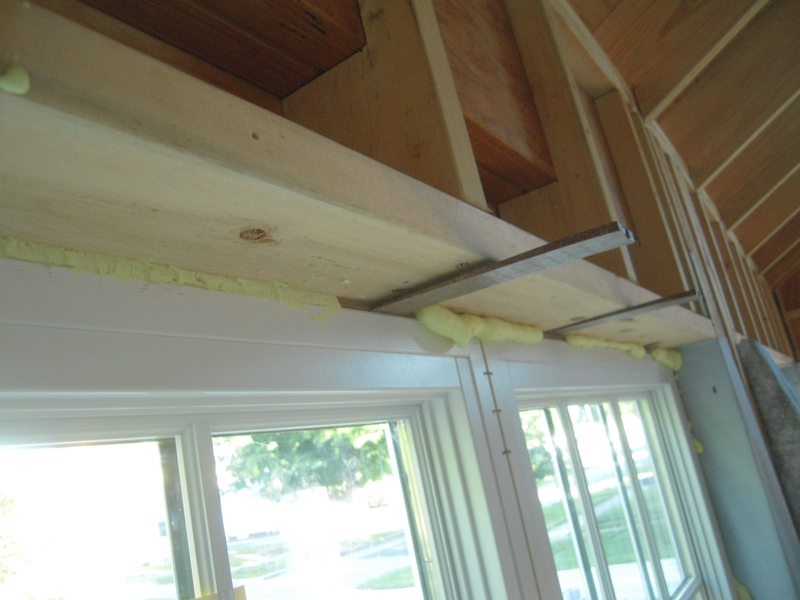 This allows you to insulate the corners after the sheathing is on. 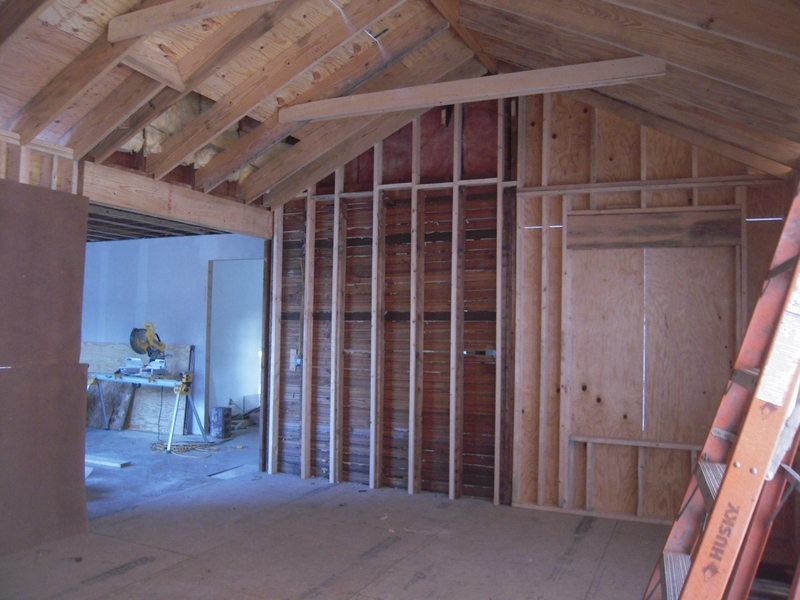 The old school guys used different construction methods which would leave voids in the corner after sheathing. I filled all the voids in the corners with rigid foam before they came back to sheath the walls. Here the sheathing is going on. 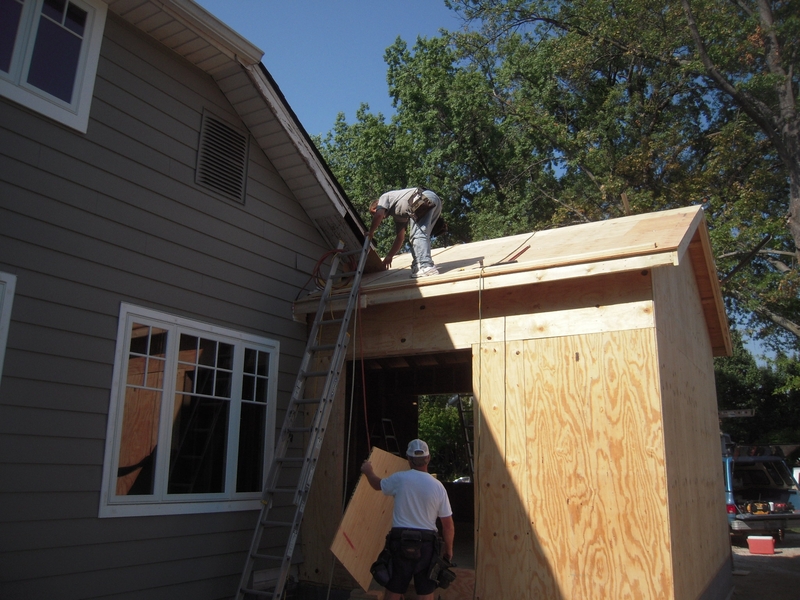 Most folks use strand board for exterior sheathing. I’ve never been a big fan of strand because it has less nail holding power over plywood. I also like to go over code requirements. 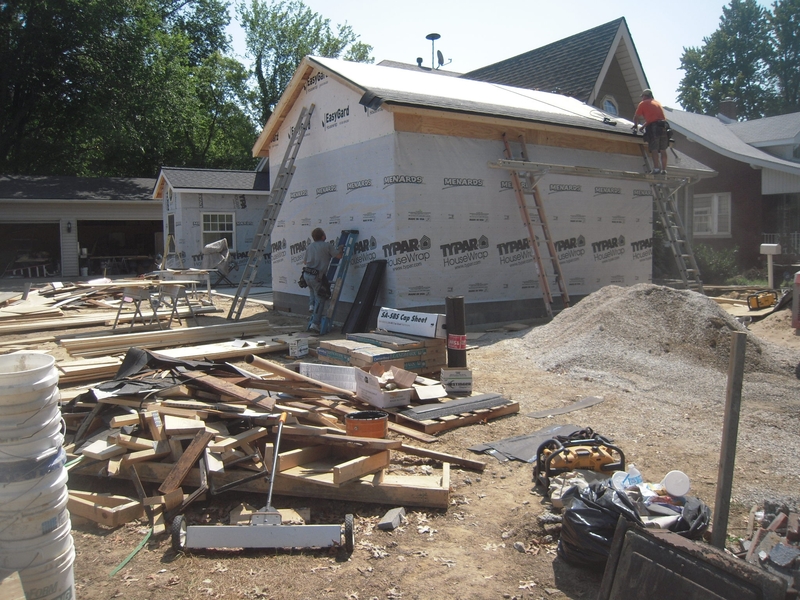 In our area, the roof sheathing minimum is 7/16″ I use 5/8″ CDX ply, wall minimum is 3/8″ and I used 1/2″ CDX ply. Here you can see the sight line from the kitchen. The reason this thing has taken so long and cost so much is that ‘no plan’ thing again. I started a couple of years ago thinking I wouldn’t be adding the sunroom – so I had placed a new custom exterior 4′ french door at the tune of 700.00 – now gone. The wine bar location to the left was finished, ready for cabinets and counter tops – but I decided to redo that area and raise the ceiling. 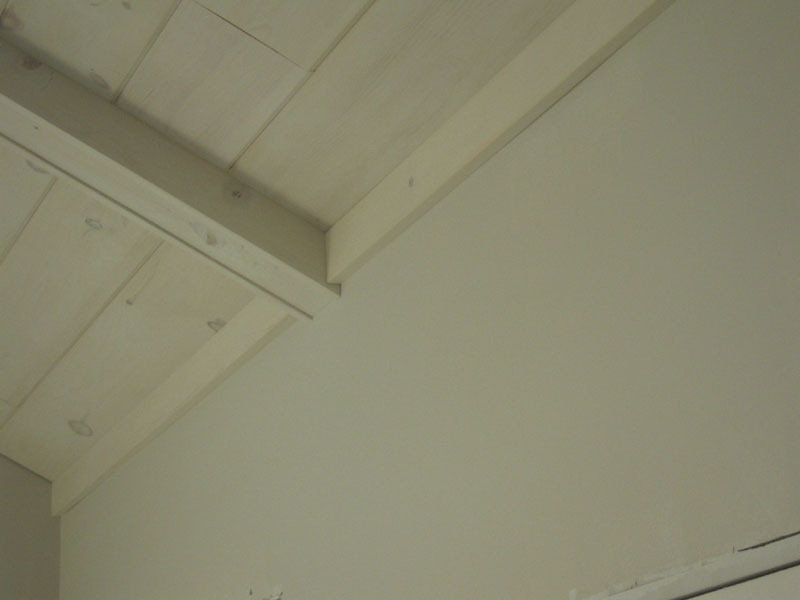 Speaking of ceilings – I have a story to tell about the one I finished, then removed in a future kitchen post. House wrap going on. So you can see that the mudroom in the back and the sunroom in the front are kinda twins. But the sunroom is bigger. The old exterior wall incorporated into the new structure. The crew put this up while I was gone, and I had to spend a few hours with a power planer to get the wall surface flat. Here is the fireplace wall. I plan to add a direct vent fireplace with media center here. Built-in cabinets and another stained glass window above. 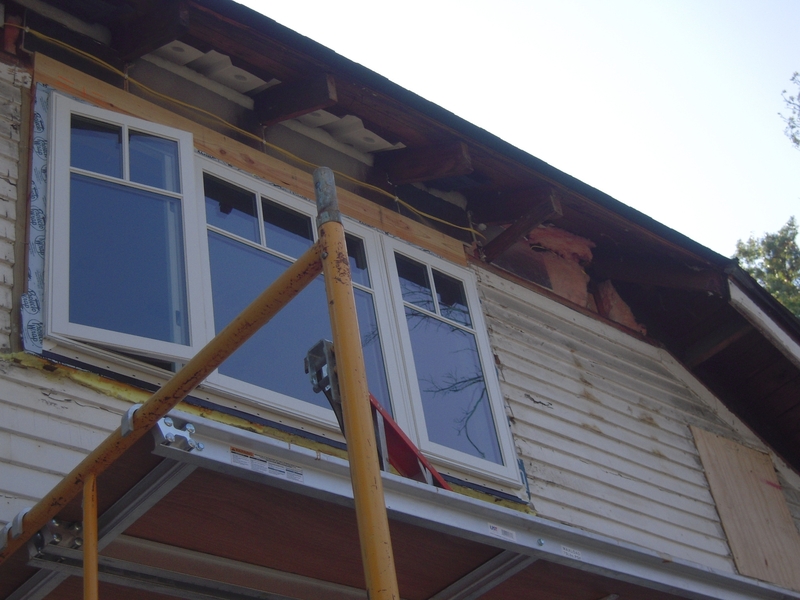 The top window was supposed to be an octagonal window – but the framers didn’t do the rough framing. I’ll show you how to do it later – maybe they’ll take notes. And the wine bar area before I tear it apart for the second time. I swear I have too much energy and not enough sense. You can see the 2X12 headers that are used above all of the openings – this will allow 8′ openings into each space. Most rooms have 9′ ceilings. This is a long drawn-out adventure – and I think my five little feathered friends would agree – or is that my five man framing crew after I put a hex on them? Stick around – more hi-jinx to come. As we continue with this pesky addition, we still have stuff to fix in the floor/foundation department – but we’ll get there. Now that we have the new floor joists tied into the floor trusses, we can turn our attention to the wall removal to the kitchen. 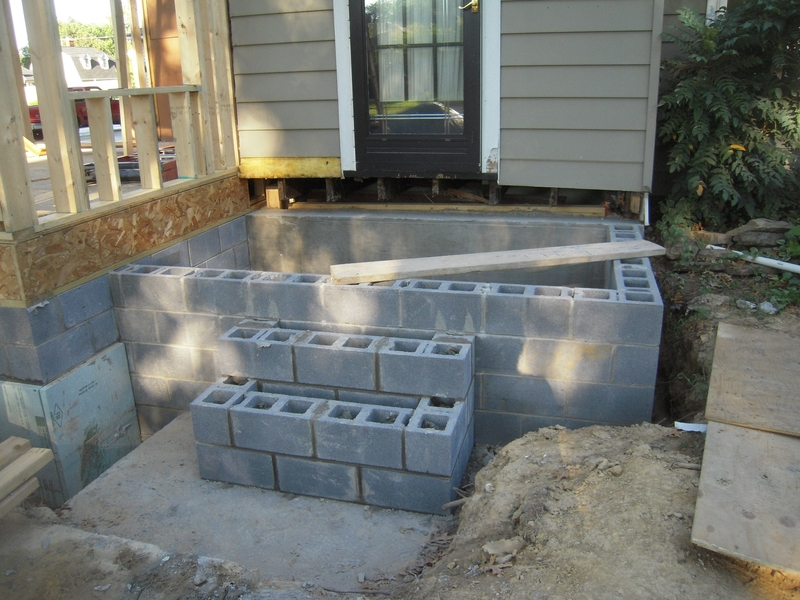 These were the exterior walls to the old concrete porch. 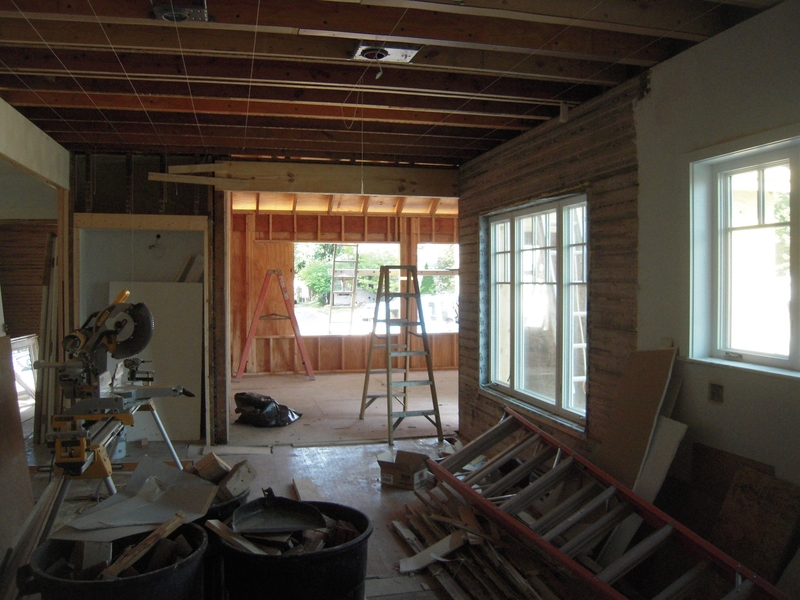 This is a view from the Kitchen towards the sunroom – I mean where the kitchen will be sooner or later. The old exterior wall has to come down so that I can build a header to tie into the new room structure. Here the wall is removed and the floor decking is down. This is Advantech Flooring. This stuff is heavy and is a great subfloor material. The view of the crawl space as the floor goes over the top. The start of wall construction. 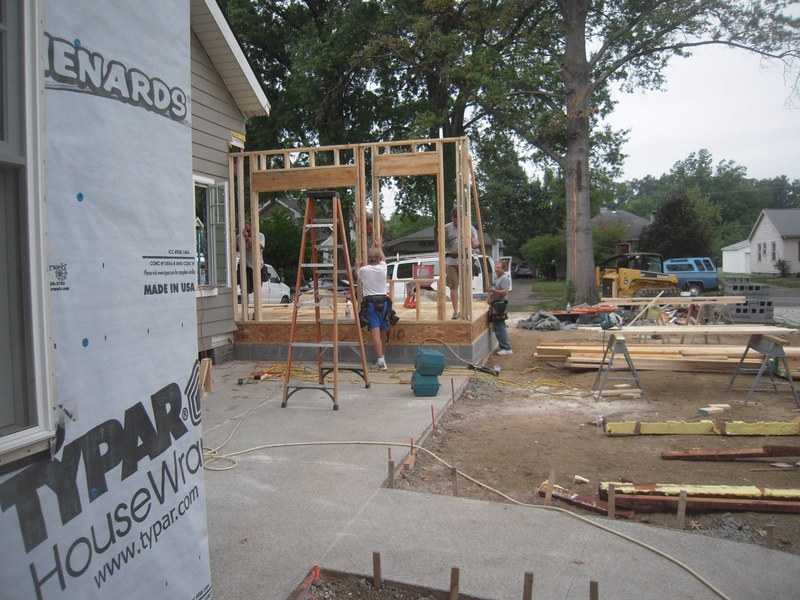 2X6 walls going up by my one week framing crew. First wall going up. It won’t take too long for this small room. Of course it’s time for some more rain. This is where that subfloor is great. The stuff can handle a lot of water without lamination issues. 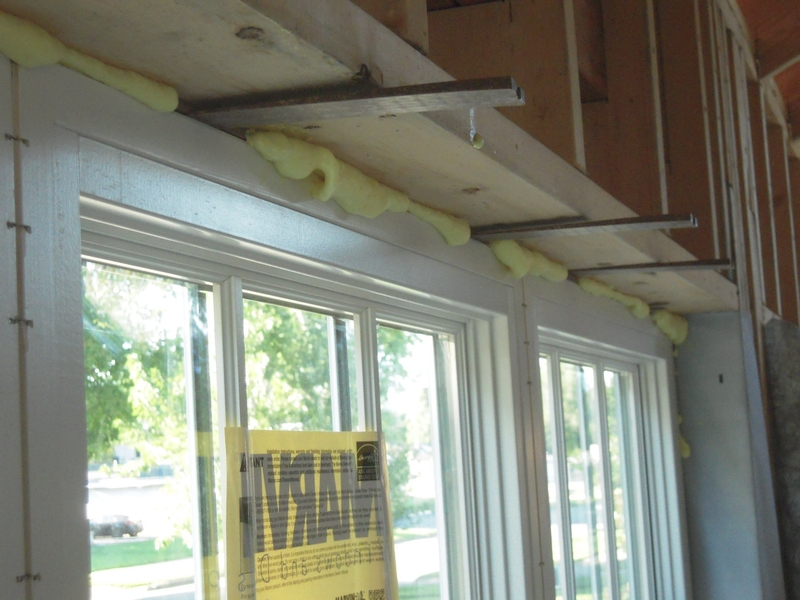 Also in this picture you see the double laminated beams that go over the front window openings. This will provide more structural strength both for vertical and lateral stability. This shows how the new room will be incorporated into the existing elevations. The ridge is set. This is a double thick laminated 24′ beam – it took 7 guys and a front end loader to set this thing 14′ in the air. So it wasn’t a single guy project like the mudroom. Framing done here. Well, except the end wall windows are not the right size, but nothing that can’t be fixed. 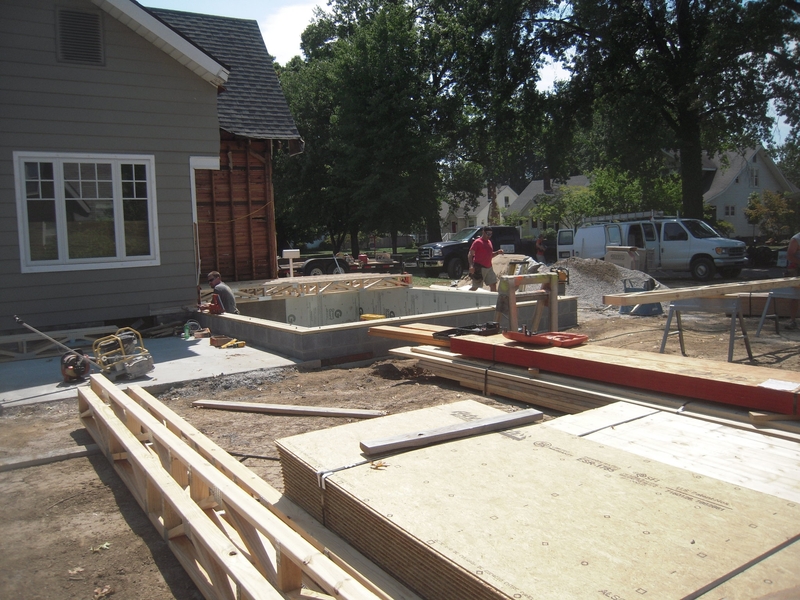 While rough framing is underway – the steps and front entry are blocked in. So we keep marching along – lot’s more to do. Now that we have most (not all) of the foundation issues resolved,it’s time to start building something! 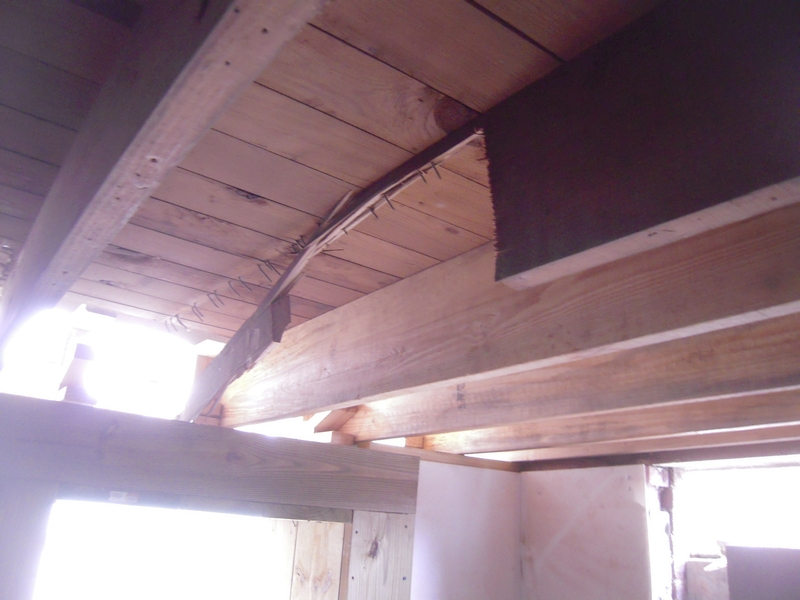 This is a long post because I wanted to show just how easy it is to replace those rotted out floor joists. Materials arrive for the build. 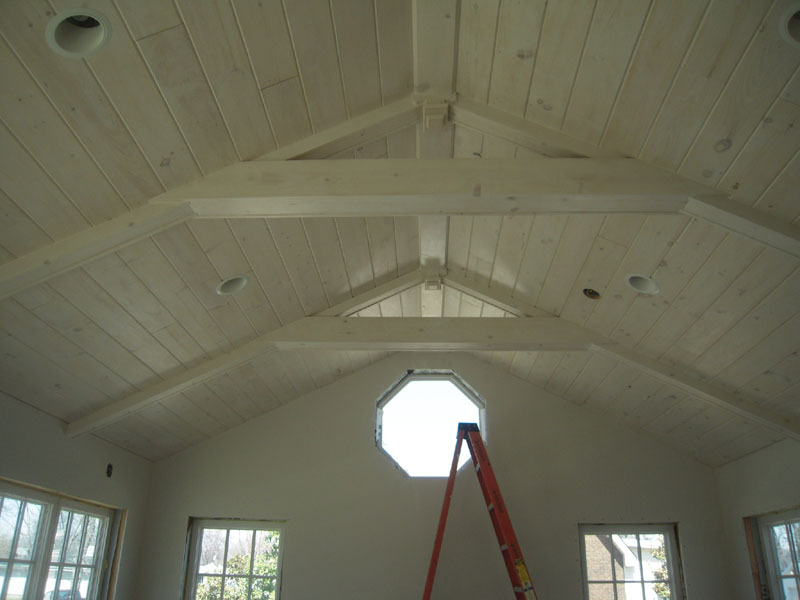 I specified open web trusses for the floor. 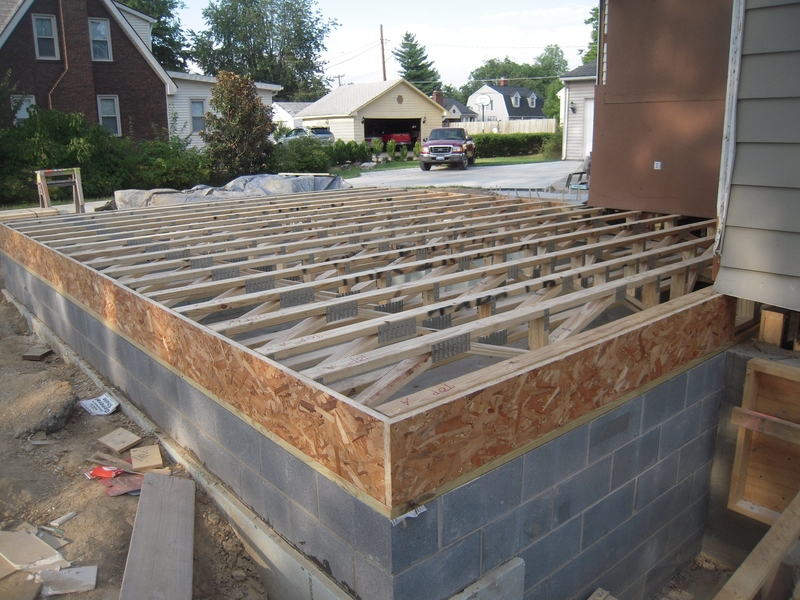 You have three common choices for a wood floor system – dimensional lumber like 2X10″ floor joists, “I” joists which is a strandboard panel capped by 2X lumber on edge or the open web truss pictured. I selected these because I want to run all of the HVAC pipes and other mechanicals through the truss, not under, so that I have maximum space in the crawl area. Here’s the start of setting the trusses. I used a carpentry crew for the rough build. I built the mudroom by myself and it took about two months – too much time to be without a roof on this structure. These guys will be here for a week and get it under roof. 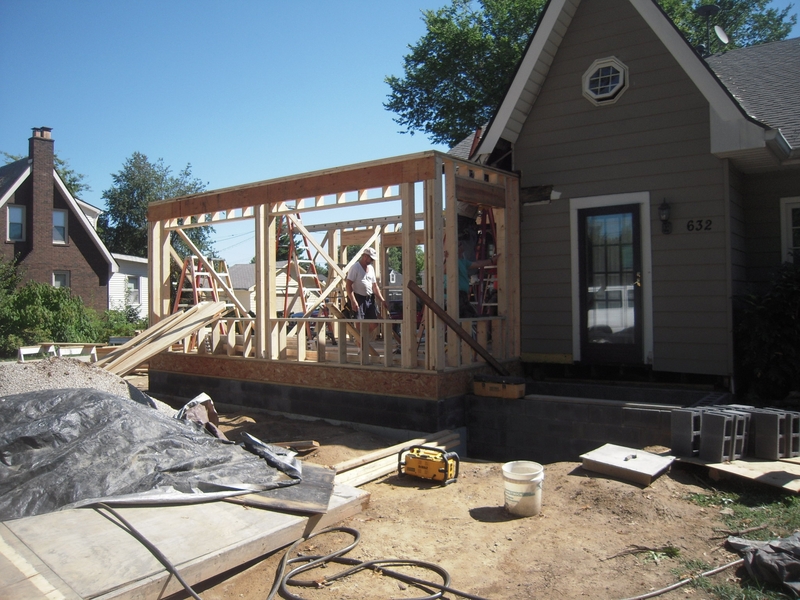 The trusses are in place and the Solid Start rim boards are attached. 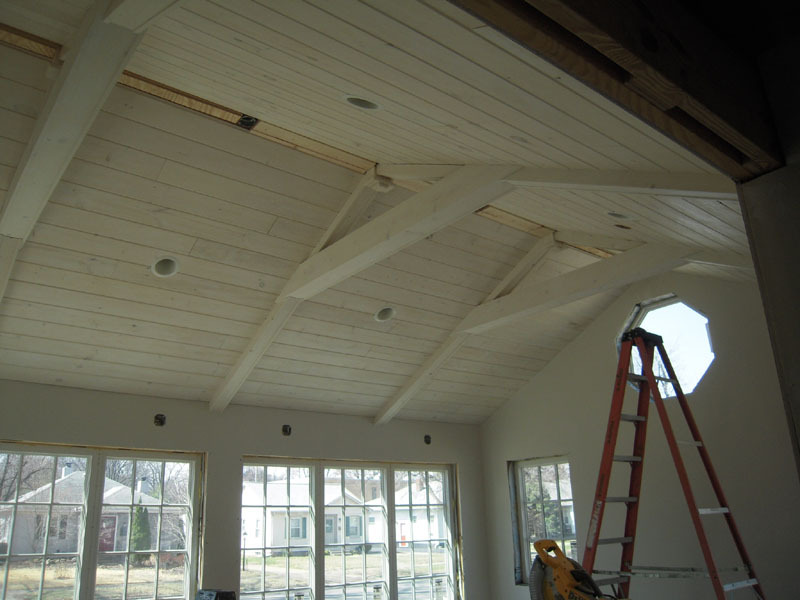 Engineered rim boards were used because I had custom trusses made to a specific height to match the existing floor levels. This was to keep the sunroom’s floor on the same plane as the existing floor. You’ll see why that’s important (at least to me) in a latter post. We’re finally going jackless! The front foundation was framed and the pour is underway. Final pour for the front foundation is in. No more concrete trucks – for now. 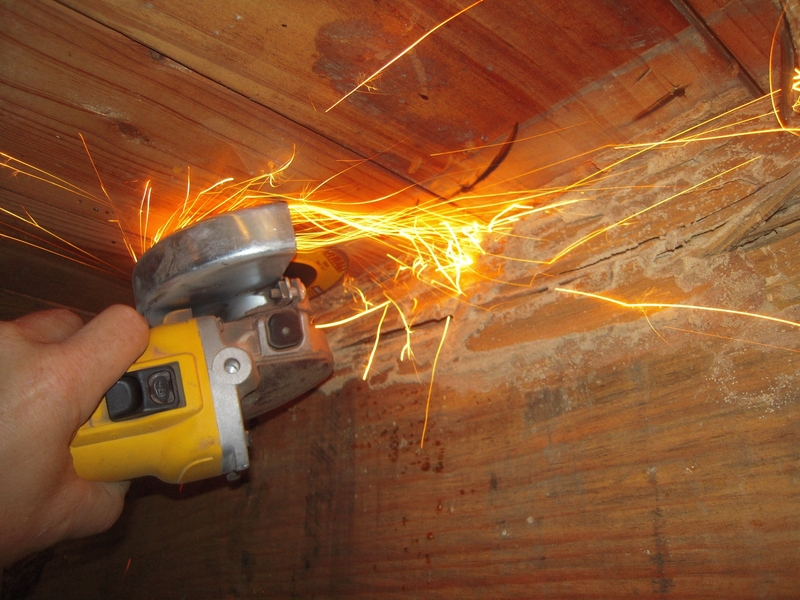 Now we can turn our attention to those rotten and termite eaten floor joists. I’ve replaced 20 or so of these, so I did develop a system that seemed to work for me. 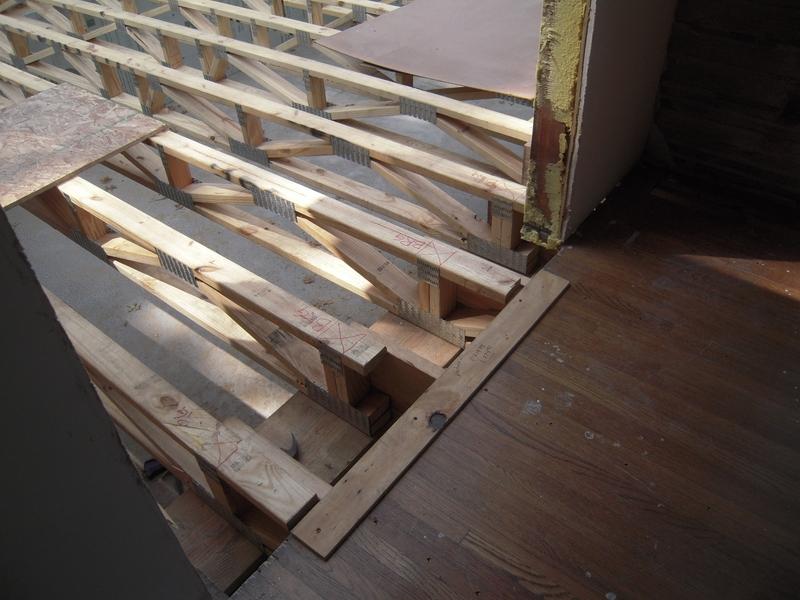 You see in the above photo that the existing floor joists don’t line up with the new floor trusses. This is a bad thing, and a good thing. Bad because they don’t line up – good, because we have to replace them anyway. 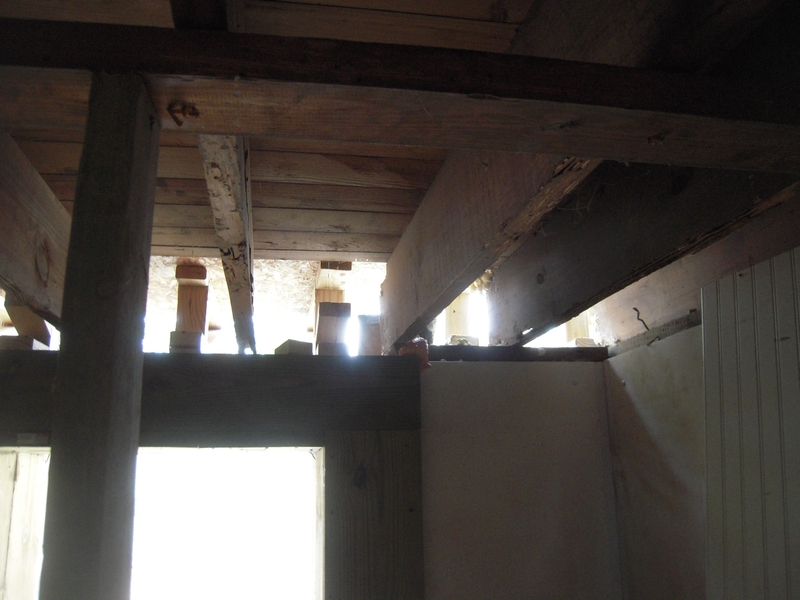 To remove the joist just cut it 3/4 the way up towards the top of the floor joist from below. I will say that you don’t need to jack up the floor unless it’s on the exterior wall, but you must do one at a time from start to finish. If you do have excessive sagging a temporary support wall will do the trick. Then get a small sledge and beat the crap out of it. Split the bottom off and continue to pound away. The red chalk lines you see in the picture is where the new joist will go. Once you get to this stage you can pry the remaining wood away from the flooring nails. 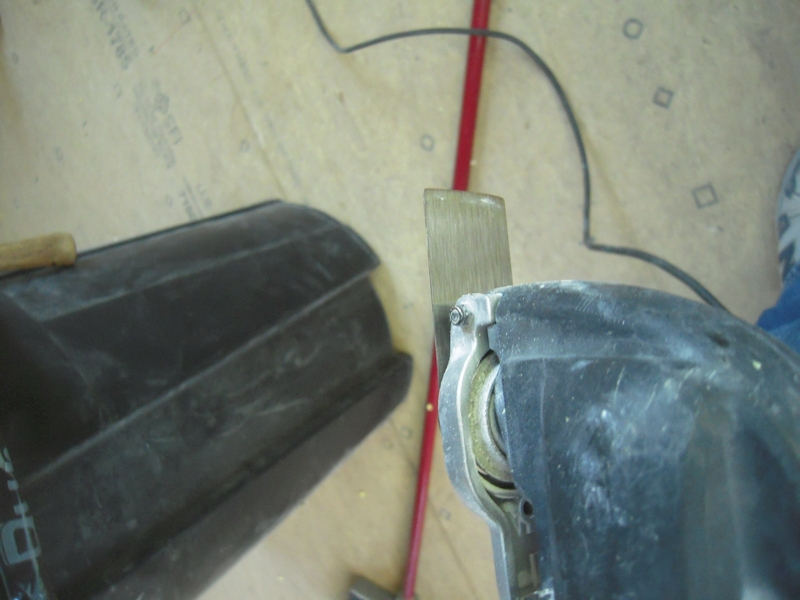 Take your trusty angle grinder and grind them off flush to the floor. In this step it’s important that you take care not to burn your house down. 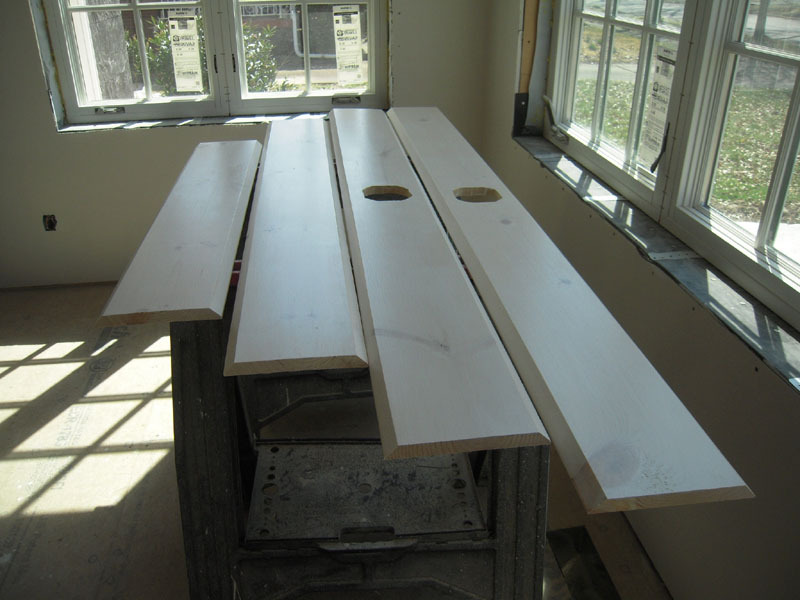 Use some PL glue in the proper place and get ready to beat the wood a little more. Since I install these by myself it’s good to have a clamp on one end to apply pressure – this way when you’re working on the other end it won’t bounce out of position. Here the clamp is putting pressure to the new floor joist. 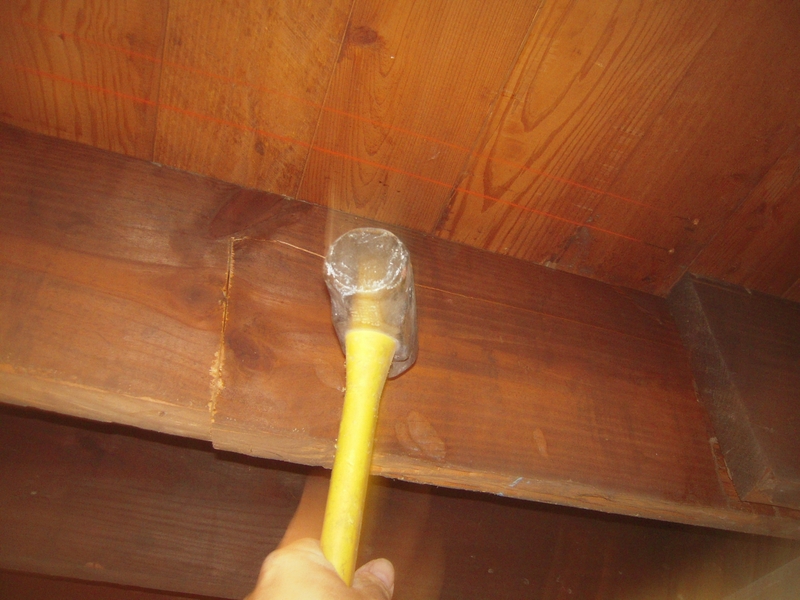 You just work it by hammering the joist until it is upright. This is how the floor trusses are tied to the new floor joists. They are both sitting on the new poured wall foundation. 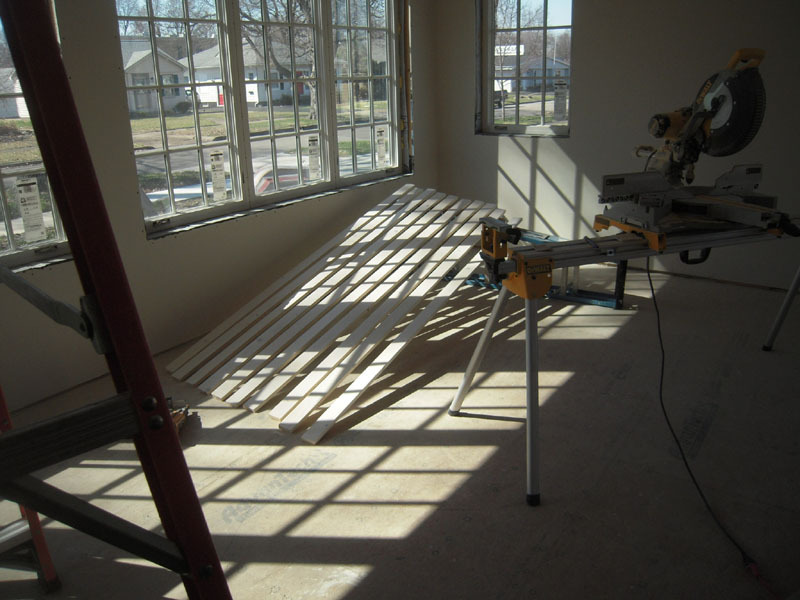 The old floor level will have a 1/2″ plywood overlay before the hardwood floors are installed. 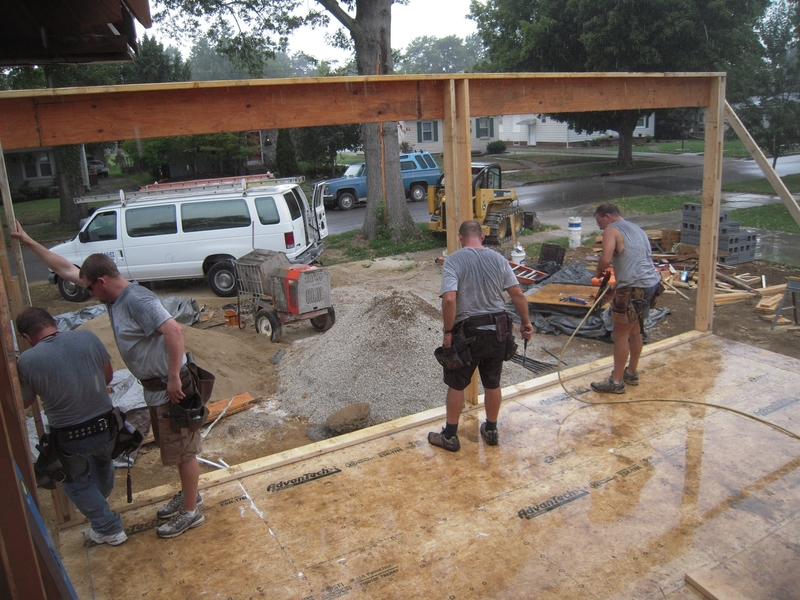 The trusses will only have a 3/4″ subfloor and the hardwood will be applied over that. 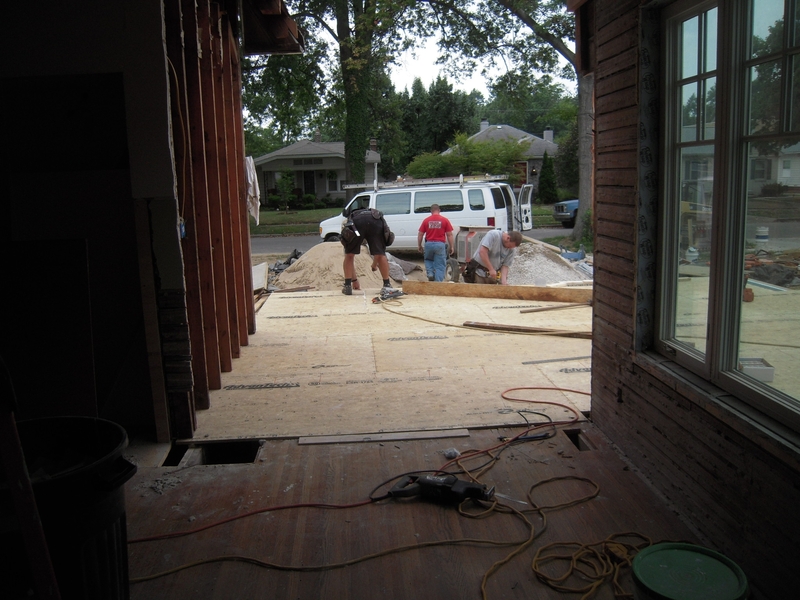 This will give a seamless floor transition from the kitchen into the sunroom. 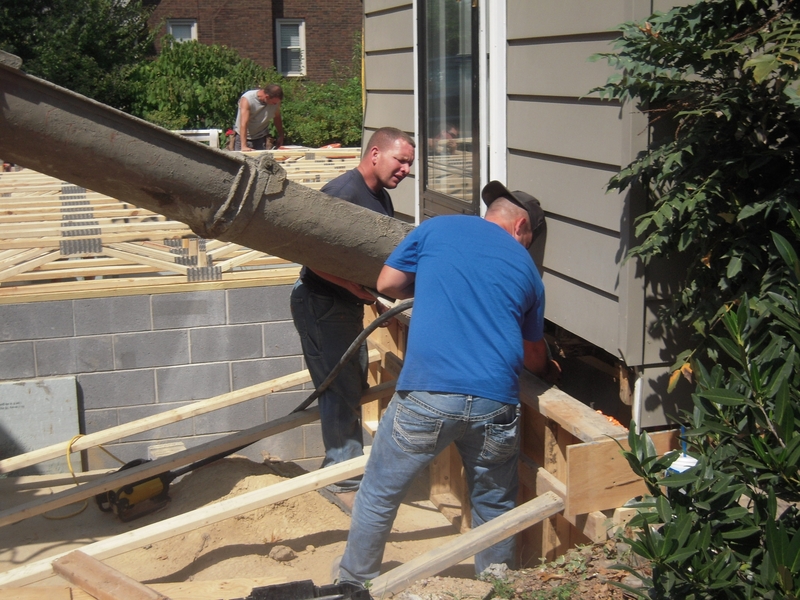 Once the floor joists are in place I fasten construction screws through the floor into the joist from the top every 4-6″ the length of the joists. So we’ll just keep moving along. Stay with me – one day I’ll get to paint something.